The official title of this solemn feastday is “The Universal Elevation of the Holy and Life-Giving Cross” (Η Παγκόσμιος Ύψωσης του Τιμιού & Ζωοποιού Σταυρού); but is better known by its abbreviated titles as the “Elevation” or “Exaltation of the Holy Cross”. It is one of four solemn feasts dedicated to the event of the Crucifixion and the importance of the symbol and role in which the actual Cross of Christ played within God’s economy of salvation. First and foremost amongst these four solemn or “penthimos” feasts, is Holy Friday (Μεγάλη Παρασκευή) which marks the final moments of Christ’s Incarnational ministry. Holy Friday is followed in importance by Elevation of the Holy Cross which is designated as a second Holy Friday within the liturgical calendar, and to which the same strict fast and devotion is applied. The next feast is the Veneration of the Holy Cross (Σταυροπροσκυνήσεως), which occurs on the third Sunday of Great Lent and marks its middle point. It serves as a reminder to the faithful of Christ’s journey towards the ministry of the Cross, as well as our own journey towards it, throughout our own lives along with our liturgical journey towards Holy Week, and specifically Holy Friday. The final and lesser known of all four solemn feasts, is “The Remembrance and Procession of the Holy and Life-Giving Cross” (Η Ανάμνησις & Πρόοδος του Τιμιού & Ζωοποιού Σταυρού), simply known as the Procession of the Holy Cross. 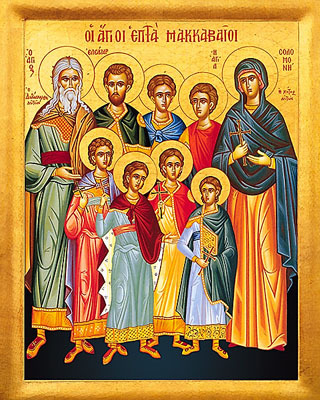 This particular day (1 August) marks the beginning of the Dormition Fast period and the journey towards the feast of the Elevation of the Holy Cross, as well as honour the Holy Maccabean Martyrs of the Old Testament. This in full, are the four solemn feasts of the Holy Cross which reveal an eternal truth to humanity that philosophers, mystics and people of differing faiths all bear witness to; which is that sacrifice, perseverance and effort are necessary in life, in order to realise our goals, aspirations, transformation and the betterment of humanity and ourselves. 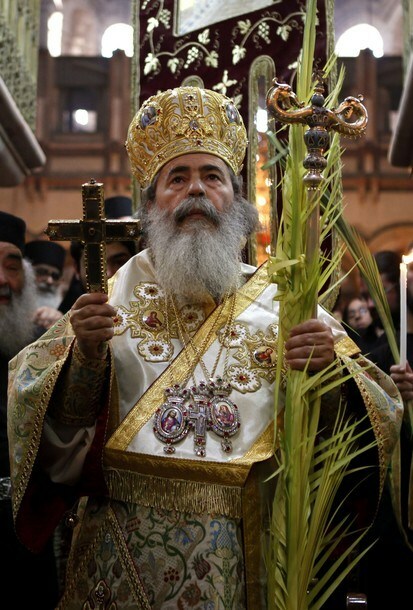 Yet within the Orthodox liturgical cycle this point is emphasised in conjunction with all the other meanings and significance of the Cross, by the designation of a one-day Forefeast and an Eight-day Afterfeast to the Elevation of the Holy Cross. The Saturday and Sunday before and after September 14 are also commemorated with special Epistle and Gospel readings about the Cross at the Divine Liturgy. Therefore, the key point is that this feastday not only “re-enacts” the events of Christ’s own journey towards the Cross, or our own journey in life, but “re-lives” that event and reality which took place some 2000 years ago, as a mystery occurring now in our present midst. It is for this reason, the Orthodox Church identifies it as a “penthimos” feast, and is considered as a second “Holy Friday” to which a strict fast applies, whereby all dairy, meat, fish, oil, wine and margarine food products are not consumed. Without doubt, as attested by the plethora of writings and references made by chroniclers and various Church Fathers, ranging from St Ambrose of Milan, St Cyril of Jerusalem, Aetheria, Sozomen, St John Chrysostom, Eusebius of Caesarea and to many more, that this feast had its origins within the Church of Jerusalem and was a devotion of all of Palestine. Initially this feast encompassed two days, because it marked two key events, that of the dedication of the Church of the Resurrection (13th September) and the discovery of the Holy Cross of Christ in Jerusalem (14th September). It is not clear which event occurred first and thus inspired the effort for the other, but according to Eusebius’ Ecclesiastical History, the dedication ceremony for the Church of the Resurrection occurred about 335AD. But the discovery of the Cross must have occurred very close to this date, since St Cyril of Jerusalem makes reference to the existing devotion of the discovered Cross in 347AD. 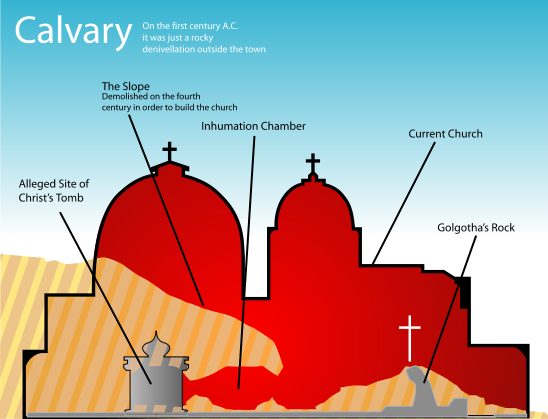 Subsequently the site of Golgotha in turn had a church dedicated to the Crucifixion, while in time it would grow and merge with the basilican church dedicated to the Holy Resurrection, and thus became the revered Christian complex known to us as the Holy Sepulchre. Nevertheless, the discovery and raising of the Cross from its burial ground progressively began to eclipse the significance of the dedication of the Church of the Resurrection, as attested to by the writings of Alexander the Monk in the 6th century who refers to September 14 as “The Elevation of the Holy Cross”. Naturally popular devotion played a key role in this development, but it was influential ecclesial figures like St John Chrysostom, who articulated further the theology of the Cross that helped increase its popularity within liturgical expression (particularly in iconography and hymnography). To St John Chrysostom, the Cross was central to God’s loving kindness towards humanity, since it was a symbol of His providential care for Creation, and that salvation of the world was rooted in the Cross of Christ. He then points out, drawing upon St Paul’s teachings, that it is through Baptism and the Cross that humanity is freed from the excesses that the Old Covenant Law was subjected to, and the consequences of humanity following in the ways of Adam’s sin and being bound by the devil. This is aptly captured by the Sticheron of Tone 5 from the Festal Vespers which proclaims that: “the curse was abolished, incorruptible life flowered again, earthly creatures have acquired deification and the demon has been decisively overthrown”. To which this festival of the Raising of the Cross is a glorification of the Cross of Christ which recognises the universal truth that, “the foolishness of God is wiser than men; and the weakness of God is stronger than men” (1 Cor. 1:25). “When Thou wast crucified, O Christ, all the creation saw and trembled. The foundations of the earth quaked in fear of Thy power. The lights of heaven hid themselves and the veil of the temple was rent in twain, the mountains trembled and the rocks were split”. –From Stichera after the sixth Gospel in the Service of the 12 Gospels, Holy Thursday Evening Service. “O Lord, upon the Cross Thou hast torn up the record of our sins; numbered among the departed, Thou hast bound fast the ruler of hell, delivering all men from the chains of death by Thy Resurrection. Through this Thy Resurrection, O Lord, who lovest mankind, we have been granted light, and cry to Thee: Remember us also, Saviour in Thy Kingdom”. –From Stichera after the sixth Gospel in the Service of the 12 Gospels, Holy Thursday Evening Service. With respects to the festal title of “Elevation” or “Raising” (Ύψωσης), the reference not only highlights the raising of the Cross from the place of its 300 year burial, but is an actual reference to the original liturgical practice of the feast. 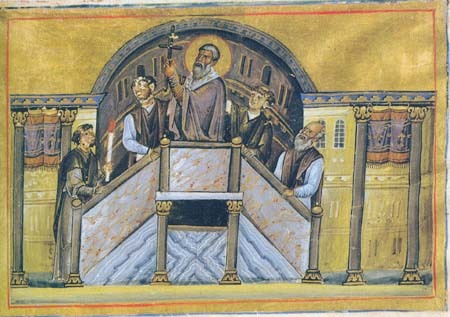 On the day of the feast, a high ambon (pulpit) would be set up in the common courtyard of the churches of the Resurrection and Crucifixion, whereby the Patriarch of Jerusalem would ascend carrying the Cross and then elevating it upright within the centre of the ambon to the chanting by the multitudes of “Lord have mercy” (Κύριε ελέησον). The Cross was naturally elevated above the height of the crowd overlooking them for the duration of the liturgical services that took place outdoors. This practiced temporarily ceased when the Persians invaded Jerusalem and seized the Cross of Christ, taking it back to Persia with them. The practice resumed when the Byzantines defeated the Persians and recovered the Cross. However for safe keeping, and with the threats of civil unrest, and invasions of the Mohammedan Arabs in the Middle East, and the Slavs on the northern frontiers, the Cross was taken to the imperial capital of Constantinople (Istanbul). 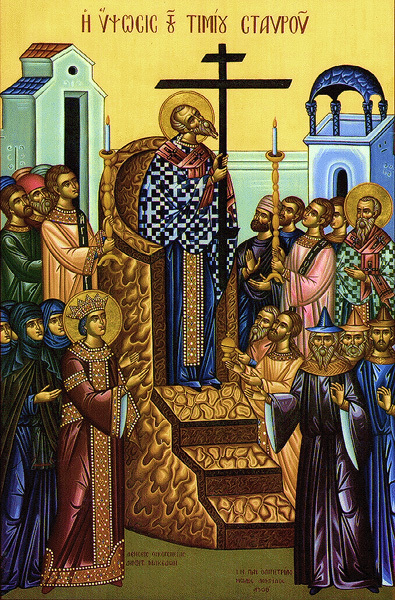 When the Cross arrived for the feastday in 633AD, Ecumenical Patriarch Sergios led a procession carrying the Cross, from Blacharnes to the Church of the Holy Wisdom (Hagia Sophia). It was inside the church, at its centre, that he ascended the ambon and raised the Cross upon it, with the multitudes chanting “Lord have mercy”, and so the service of the feast would begin. 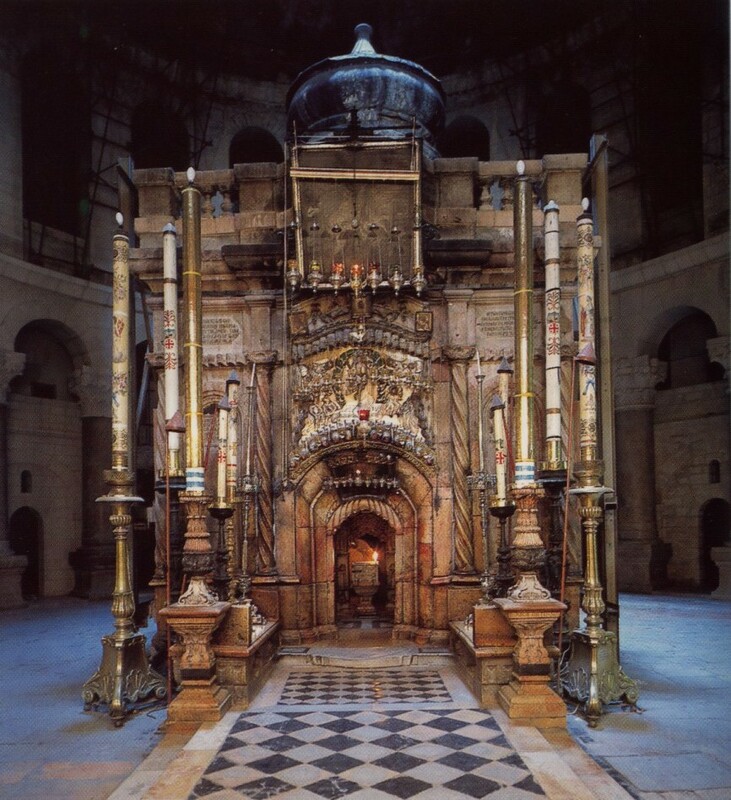 The Cross had been brought to the imperial city due to the threats posed to Jerusalem’s security, but it was not long afterwards that with the consent of the Patriarchate and people of Jerusalem, that for the safety and survival of the Holy Cross, that it was cut up into various pieces and distributed to the major centres of Christianity. Consequently, the feast became widespread throughout Christendom, as references of Pope Sergios of Rome, citing the celebration of the Exaltation of the Cross during his episcopal tenure (687-701AD). Invariably, this feast holds immense importance within Christian history and belief, because it was both a religious feast and a day of political importance, equivalent to the status that national day celebrations are accorded within modern day political states and nations. Yet to better appreciate and understand this dual significance and the origins of the feast of the Elevation of the Holy Cross, we must look at the historical context and tradition from which it springs forth. Of the many feastdays of the Orthodox Church, the Exaltation of the Holy Cross is quite well documented, with fairly detailed historical and spiritual accounts of its origins and development. It is a feast which is very closely tied to immensely significant historical events and figures, so it is not surprising that it has a rich and detailed history which may not seem spiritually relevant, but are crucial to the origin and development of the feast and its meaning. One cannot attain an appreciation of this feast without learning of this context, because many of those events that are inextricably linked to the feast have created the world we live in. 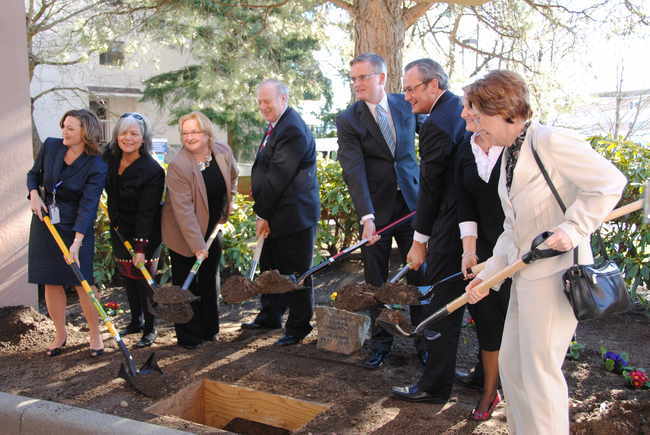 It is a legacy that for many, remains unknown or forgotten. 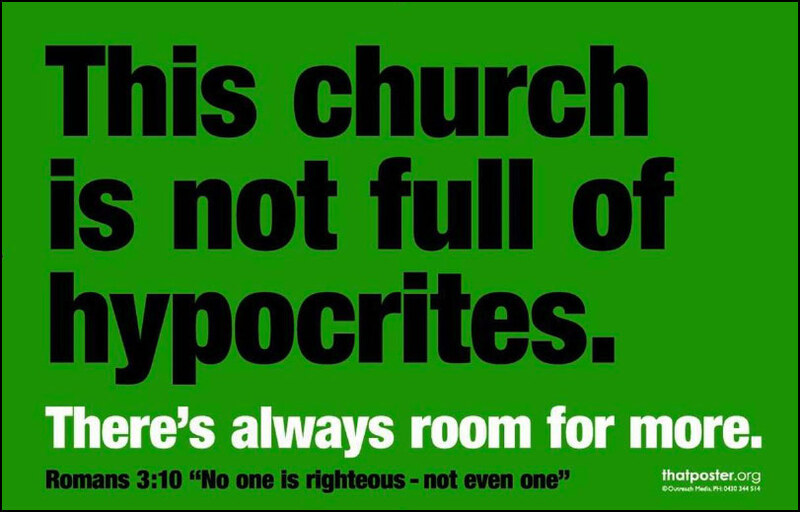 And yet it is at the heart of the collective Christian psyche of historical undivided Christendom, before the existence of any “denominations” and “churches”, because it was “pre-denominational” for there was only One Christian, Holy, Apostolic and Catholic Church. 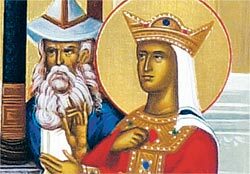 In looking at this historical context and its associated tradition, there is no doubt that its presence and character within Christian devotion is closely entwined with the figures of St and Emperor Constantine the Great, and his mother St Helen. The era in which St Constantine was born into, was a time of immense socio-political upheaval and anxiety since the assassination of Emperor Commodus in 192AD ended the Antonine dynasty. The Roman world descended into a period of virtual anarchy, whereby civil wars were fought over for the imperial succession, corruption and lawlessness became rife. This in turn led to the economy to flail with taxation, inflation and unemployment to increase exponentially. Businesses were going bankrupt, farms were abandoned, infrastructure left to decay and the population was in decline due to malnutrition, plagues and the violent class conflicts that ensued. Naturally the empire’s defences were sorely neglected, leaving the door open to the onslaught of foreign powers or barbarian marauders to invade and seize whatever they coveted. 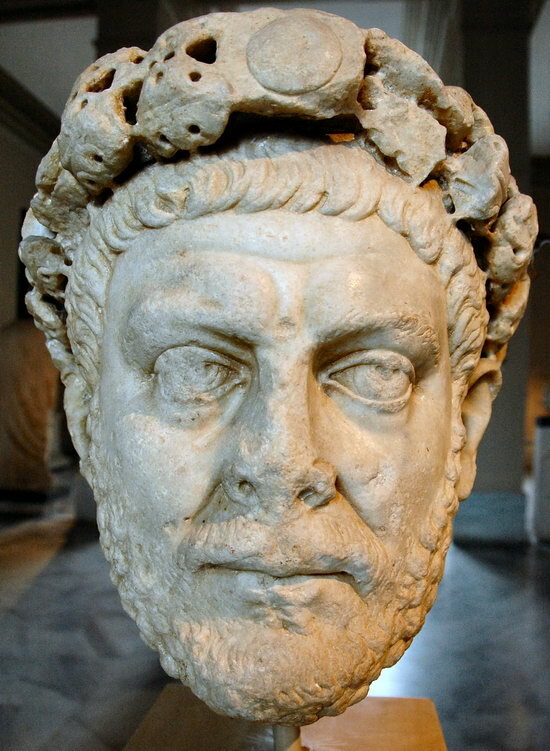 Yet order was restored in 284AD by the successful coup of a military commander known to history as Emperor Diocletian. Diocletian was supported by St Constantine’s father, Flavius Constantius, along with commanders Maximian and Galerius. The immediate task set before Diocletian was the overhaul and reform of Roman governance, to which effect he divided the empire in two, appointing Maximian as Emperor in the west with Flavius Constantius as his deputy; while in the east he ruled, with Galerius serving as his deputy. The establishment of this tetrarchy helped resolve the issue of succession and made administering the empire more efficient and effective. Each Caesar based their capital near the frontiers, where their main attention was focused upon the empire’s defences. St Constantine (Flavius Valerius Aurelis Constantius) though, was born during the time prior to the full restoration of order in around 272AD, when his father was still residing and serving in the army at Naissus (Nis, Serbia). From existing accounts, as well as Constantine’s own witness, his father was a Roman officer who was initially a pagan, but was well-disposed towards Christianity. It is only St Constantine who mentions that his father had become a Christian and had played a role within his spiritual formation. 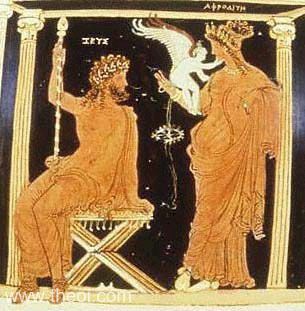 His mother Helena, was a Greek of humble working-class origins whose family came from Drepano of Bithynia (Asia Minor), and earnt her living as a barmaid. Yet from all accounts, we know that she was a crypto-Christian, and may have exercised a significant role in influencing her husband’s faith and disposition towards Christianity. But the crucial spiritual influence that she wielded, was upon Constantine’s own piety and spiritual formation. However, the other key influence, and probably the beginning of Constantine’s own journey towards faith occurs around the time Diocletian requested his presence to reside with him, at his capital in Nicomedia (Iznik, Turkey) as a “guest”. Even though Constantine received further military training, went on campaign and resided in comfort at Nicomedia, the real purpose of being Diocletian’s “guest” was to ensure the loyalty of Constantine’s father, and prevent him from colluding with Maximian to undermine his own position. Yet this time was a revelation for the young Constantine in that he witnessed the ideological war of persecution that Diocletian waged against the Christians and various other religions. 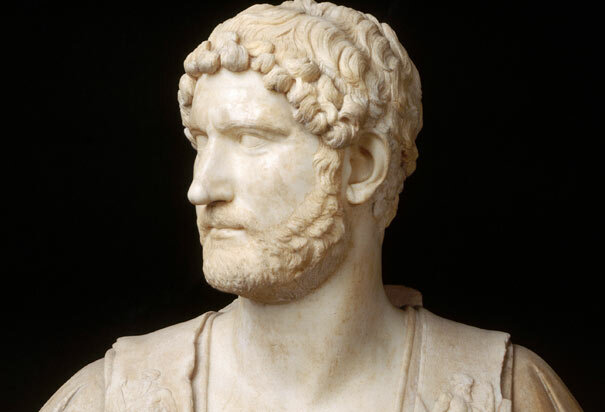 This “internal war” of the empire against her own populace, was grounded in Diocletian’s belief that the due honour to the pagan deities of Greece and Rome had not been accorded, thus explaining the empire’s decline and recent experience of anarchy. In Diocletian’s mind there was no doubt, that the waning popularity and adherence to the worship of the gods, as well as to the imperial cult of an emperor’s “divine honours” were at the core of the empire’s socio-economic, moral and political decay. To Diocletian, the restoration, honour and strict adherence to these cults were essential to the empire’s regeneration and “civilising” mission. The presence of “new” or “foreign” religions and cults were to blame for this state of affairs, for they drew away the populace’s loyalty to the empire, and her religious and secular beliefs. Therefore, to refocus the attention of the populace away from these “false”, “new” and “foreign” “diversions”, the only logical conclusion was to root them out as ruthlessly as possible, with full force. Not coincidentally, the synaxaria of the Church relate that of all the state-sponsored persecutions endured during the pagan Roman period following Christ’s ascension (about 300 years), the most sadistic, violent and brutal was that of Diocletian and Galerius. Diocletian’s own paranoia, with respects to the Christians, was magnified by the existence of a flourishing Christian community in the empire’s greatest enemy, Persia. This of itself may not have been a concern per se, if Christianity had not been so widespread within the Roman empire, constituting a sizeable minority, which archaeologists and historians estimate, made up 10% of the empire’s population. Furthermore, the Christian community was not confined to a specific ethnic, cultural or socio-economic group of Roman imperial society, for it brought together the working class with the aristocracy, the Celt with the Egyptian, the young with the old, on an equal footing. This universally unifying faith had begun to flourish and expand beyond its estimated 10% during the 92 years of Roman imperial anarchy and decay. Thus in every city and town the crown of martyrdom became part of everyday life, with even quite a considerable number of pagans being falsely accused and martyred for being Christians, Christian sympathisers or heretical pagans. Across the provinces, churches were torn down, scriptures burnt, liturgical items and sacred relics desecrated, church properties confiscated, while Christians who refused to renounce their faith were imprisoned, tortured and executed. However, there were administrators, like Constantine’s father, who did not enforce such draconian directives, or pretended that they had enforced them, since many saw that these measures destabilised the empire further by depleting it of its limited human resources; especially of law-abiding and philanthropic citizens like the Christians, who were helping to rebuild the empire. 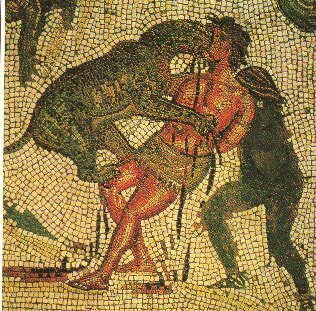 In any case the cities of Antioch, Alexandria and Nicomedia became the main focal points of Diocletian’s spectacle of inhumane barbarity with sham trials, public tortures and executions. Not far from these scenes of carnage and miscarriages of justice, was Constantine who was an eyewitness, and thus exposed him directly to the face of Christianity. Impressed and amazed by the resolve of the Christians to adhere to their beliefs and show unquestioning love of their fellow man, even to the point of sacrificing their lives willingly, intrigued Constantine to examine this faith of his parents and its particular worldview. Constantine’s orientation towards Christianity was strengthened in 303AD when he visited for the first time, Rome, in order to attend Diocletian’s 20 year reign celebrations. He was both bewildered and in awe of the grandeur and opulence of Rome which had ceased being a capital, but was still a thriving metropolis of 1 million inhabitants. We have another citation which noted that Constantine decided to escape, “when Galerius was resting after dinner, he made a hurried departure and sped on his way, getting rid of the horses of the public post at the many staging points he passed”. 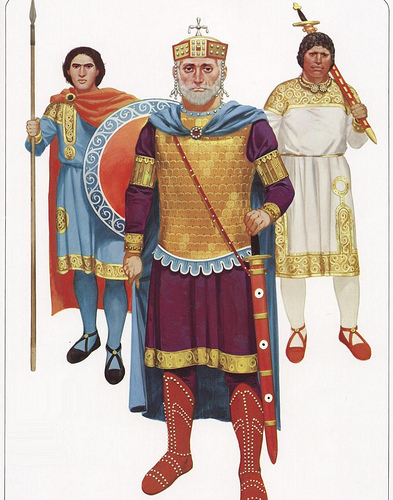 In any case Constantine learnt of his father’s location, and joined him to cross the English Channel to fight against Pictish invaders of Roman Britain. But as Flavius Constantius began to succumb further to ill health on campaign north of Hadrian’s Wall, both he and Constantine had to return to his base in Eboracum (York) in 306AD, where before the military garrison he proclaimed his son Constantine as his successor. 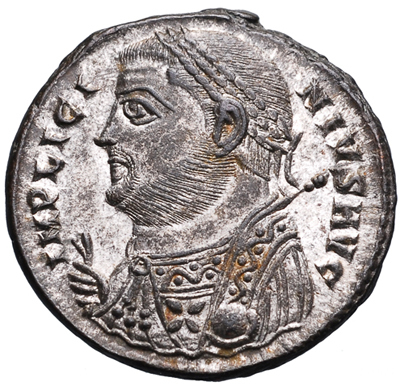 Galerius, had been entrusted with power in the east by his father-in-law, the retired Diocletian, but he was not in a position to refuse recognition of Constantine’s succession, especially given that the other western Caesar, Maximian, had accepted Constantine as co-Caesar, and was also his father-in-law. Yet this arrangement was tenuous, especially for Constantine due to the ongoing internal political manoeuvrings of the tetrarchy and the campaigns on the empire’s frontiers. In time the tetrarchy began to unravel as seven claimants over the imperial throne vied with each other for power and hegemony. Maximian’s son (Constantine’s brother-in-law), the cruel tyrant, Maxentius (ca. 279-312AD) who was hated by Christians and Pagans alike, seized power from his father and usurped the government of Italy and North Africa. 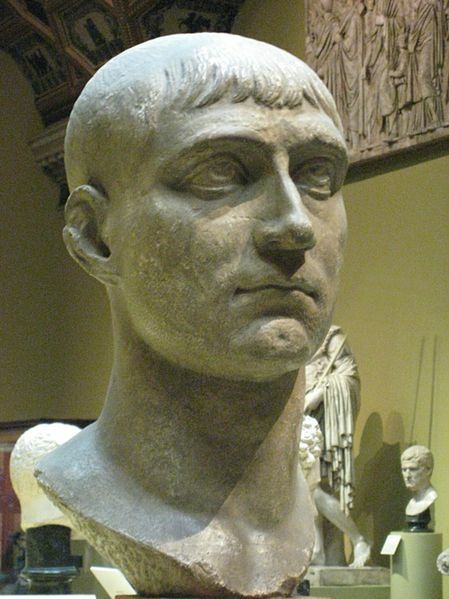 At the time, Constantine was already on campaign in Gaul when these turn of events happened, but the people from the provinces under Maxentius rule appealed to Constantine for deliverance from Maxentius’ tyranny. 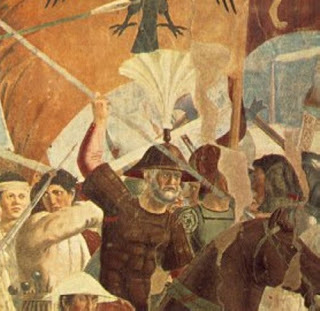 Given this plea for help and the threat posed by Maxentius to his own survival, Constantine mustered a multiethnic army of 98,000 soldiers and fought his way through Gaul and marched across the Alps, despite knowing that Maxentius had greater supplies of financing, resources and soldiers at his command to attack him. According to his own testimony, Constantine had been praying to the true living God whom the Christians worshipped. He duly noted that he had already begun his journey of conversion towards Christianity years before this expedition of liberation, but it was during this time when engaged in private prayer, where he (Constantine) prayed to God for deliverance and victory, beseeching God for a sign. 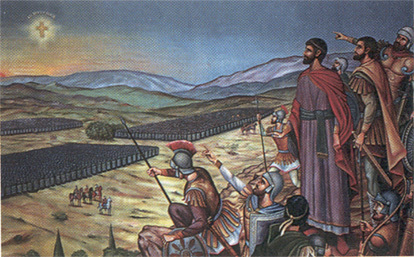 Subsequently, it was one particular day where the twilight shone prior to the descent of the darkness of night, that Constantine was praying, when together with his men, they ceased their activities to behold a vision of a shining Cross in the heavens above the setting sun, with the inscriptions: “By this Conquer” (also translated as “In this Sign your will Conquer”). According to Nikephoros and Zonaras, this inscription was in Latin, possibly “Hoc signo vinces”, but has survived in historical accounts to our own time by its Greek form: “έν τούτο νικά”. This vision was succeeded by the following night when Constantine slept and beheld a vision of Christ who directed him to affix the sign of the Cross upon his battle standards, and commanded to advance against Maxentius with immediate haste. In response, Constantine awoke and gave order that all battle standards and shields be affixed with the sign of the Cross with the Greek monogram of the first two letters of the name of Christ, “X” (Chi) and “P” (Rho). Not long afterwards, Constantine engaged and defeated Maxentius’ well-equipped and numerically superior forces in three pitched battles. By the 27th October 312AD he had reached the Tiber River at a point some 3km north of Rome, facing once again a numerically superior force that stretched all the way back to Rome itself. The populace of Rome rioted against Maxentius, because they were not keen on the idea of being besieged within the city. 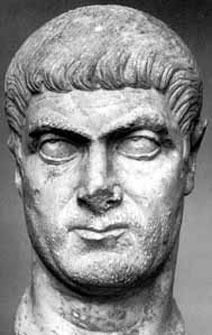 Yet Maxentius quelled the riots, but was hesitant in taking a stand against Constantine from within the city due to a lack of public favour. Providentially, the false prophets whom Maxentius consulted, had advised him to make his stand outside the walls of Rome, assuring him of victory instead of fortifying defences from within, which would have made his position unassailable. Yet it was outside Rome, at the Battle of the Milvian Bridge on the 28th October 312AD that Maxentius was defeated once and for all, and meeting his final demise during that battle by drowning in the Tiber. This resounding victory ensured Constantine’s survival and confirmed him as the sole ruler of the West Roman empire to the joy of Christians and Pagans alike who had chaffed under Maxentius’ tyranny. Some years later, when speaking to the ecclesial historian Eusebius of Caesarea, Constantine related one particular point about the battle of the Milvian Bridge. He noted that none of the standard-bearers were killed as opposed to other military campaigns he had led previously. He also expressed his thorough conviction that it was by the power of God and the sign of His life-giving Cross replacing the Roman eagle which granted victory. Constantine highlighted this point in noting that his entry into Rome was marked by the Roman custom of raising a statue of himself within the forum, but holding the standard of Christ in his right hand which broke with this Roman tradition. In returning to our discourse, Constantine had set about re-establishing order within the West, and had ensured harmony with the East via the marriage of his step-sister Constantia to one of Galerius’ closest confidants, Licinius who governed Illyria. In January 313AD at the city of Milan both he and Licinius agreed to pass an edict of religious toleration, granting full freedom to all forms of worship, with special reference and honour towards Christianity. As a result of this, Constantine began within his realms the process of reconciliation, restitution and compensation of damages and injustices endured by the Christian populace and their church communities. 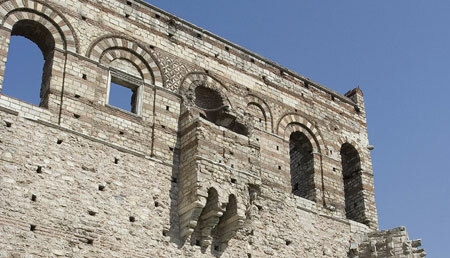 Ruined churches were rebuilt, properties seized by the state returned and civil rights restored. 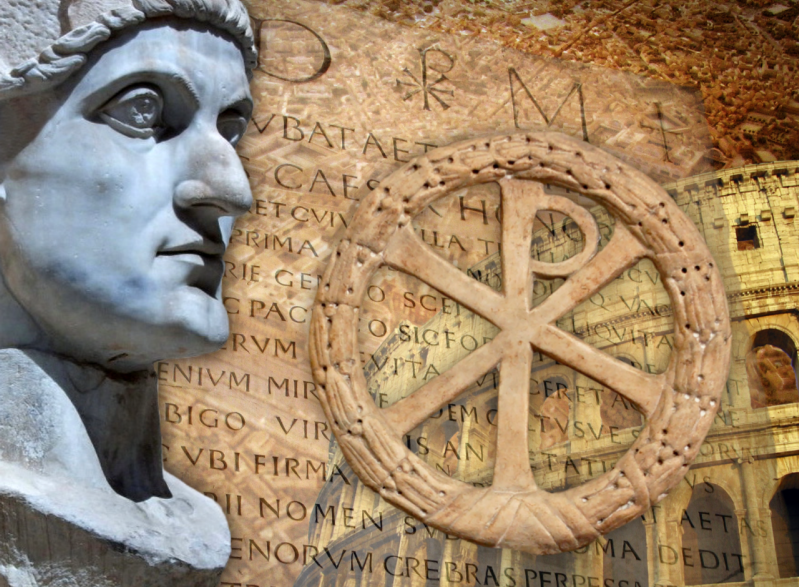 From this point onwards within the Church and world history, we begin to witness continual reverential references made towards Christianity and the Church by Constantine within his imperial directives and decrees. It is also at this point we begin to witness the Christian Church slowly emerge from the underground (like a seed of wheat within a field) to blossom forth out in the open after 300 years of persecution and discrimination. Unfortunately that emergence was not to be an easy or straightforward process, as Licinius would betray some of the key principles of the edict of toleration and conspire with one of Constantine’s sons to dethrone and murder him. Licinius made himself the figurehead and leader of the pagans who opposed the very existence, let alone the legitimate acceptance or endorsement of Christians within Roman society. Various battles and peace treaties were concluded between Constantine and Licinius, but Constantine knew that like a chess match, he would have to discern and pre-empt any moves made by Licinius. It was due to his faith in God and the presence of his step-sister that Constantine showed mercy and sought peace with Licinius. But given the tenuous socio-political problems of that era, peace and stability alluded the empire. Constantine’s own accounts of his rise to power testify to the difficulties of this era: “My father revered the Christian God and uniformly prospered, while the emperors who worshipped the heathen gods died miserable deaths”. Yet, it was Licinius who had more resources and numerically superior forces under his authority, but was defeated every time by the seasoned and battle-hardened Constantine. The final conclusion within these series of events and final triumph of Christian freedom over those pagans who sought to return them to the torments of the last 300 years, came with two crucial battles in 324AD. The first was at Adrianople (Edirne) in July, which was the largest land battle of the fourth century where the more numerous and well-supplied forces of Licinius were routed by Constantine. Licinius fled with the remainder of his forces and encamped within the besieged city of Byzantium until September, when he sought to break through the gauntlet on land and sea. Despite commanding larger naval and land forces he was blockaded and defeated by Constantine’s navy, while on land his army was defeated, and he and Constantine’s conspiring son were prosecuted and put to the sword some 3 weeks later. Constantine incurred much criticism for his action, but within the empire there was a sense that finally some sort of real semblance of order and peace was established, and that the dawn of a new era had begun. To many pagans, it showed that they had been wrong in their estimations of Christianity and that it was a sign of the triumph of the Cross over the deities to which the people had already turned away from or were indifferent to. Their curiosity to learn and investigate this unique religion was encouraged by Constantine, who had issued a public announcement to all his subjects that they may embrace Christianity of their own free-will without any hindrance or danger. All over the empire, Constantine commissioned many public works to restore the economy and the well-being of the people. Yet in the process, Constantine sought to remake the image and culture of Rome, his particular emphasis on this point was due to his provincial and militaristic disdain of Rome’s socio-ethical decay and the idle and indolent manner of her inhabitants. He envisaged a New Rome which would rival the Old Rome and contrast against its values and outlook by its Christian foundation. The city that he would rename “New Rome” was the strategically located city of Byzantium where he had finally defeated Licinius, and could use as an effective administrative centre, and military-naval base for future campaigns. He later renamed this city after himself (Constantinople) because he wanted in every way that the vision he held for this “model” city to which the rest of the empire would turn to and find inspiration, would become and remain part of him. Despite his sober militaristic upbringing, we see within Constantine a characteristic of our own human being, which is the obsession of an ideal that becomes so entwined with ourselves it becomes difficult to disengage. 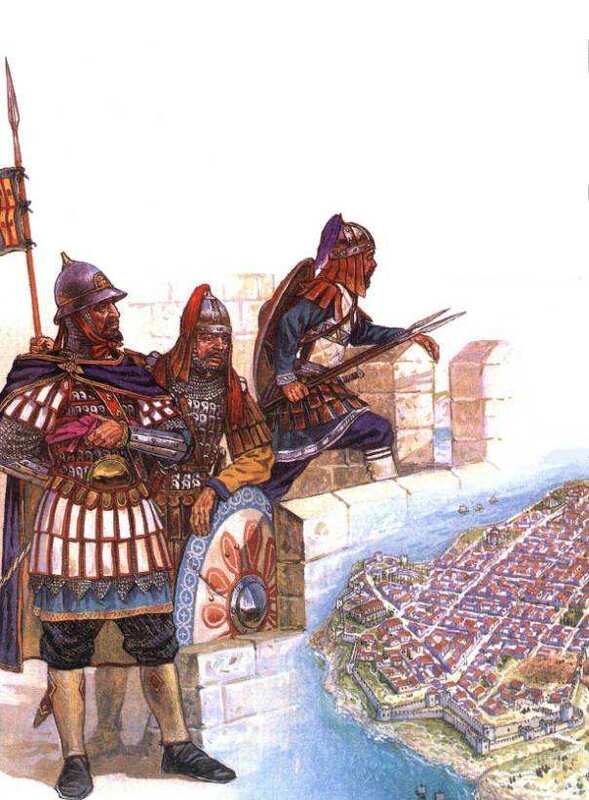 From all over the empire people, craftsmen, technicians of every sort and resources poured into Constantinople for its redevelopment and expansion. Churches were built there and all over the empire, as a grateful emperor made his thanksgiving offerings to God who had bestowed a future upon him and the people. Unfortunately the stability of the Christian Faith was challenged by the heresy of Arianism. Ever the pragmatist who understood that the Church operated upon synodical structures, and inspired by the Spirit, Constantine gathered together as many Church leaders as possible and convoked the First Ecumenical Council in Nicaea in 325AD. This council discerned and articulated what was the true belief of Christianity that the Apostles had preached and was practiced ever since. It set down the first foundations on which Arianism would be refuted by, and Constantine felt that the matter had been resolved once and for all. However, as we know from history, Arianism did not disappear and that St Constantine had been overly optimistic. Yet in that optimism he built two great basilican churches in Constantinople, the first dedicated to the Holy Peace of God (Αγία Ειρήνη) and that of the Holy Apostles. In 326AD he then turned his attention to that most important task that his mother and many Christians had desired for some 300 years, the building and dedication of the holy shrines of worship upon the places of Christ’s Passion and Resurrection. His own mother who reigned with him as “augusta” (co-ruler) at the age of 79, was not attracted by this honour of fanfare, but desired to make a pilgrimage to Jerusalem to offer her prayers and visit the Holy Sites. According to Socrates Scholasticus (ca. 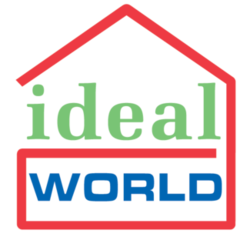 380-450AD) this desire had been inspired by many dreams which divinely directed her to go to Jerusalem and fulfil this pious wish with the blessing of God. Eusebius of Caesarea affirmed this point, to which he added that Helen wished to make prayerful petition and thanksgiving for God’s blessing upon her son and grandchildren, asking particularly for the protection and blessing for Constantine. Yet it was also to journey to eastern lands to learn of the customs and cultures of the people who inhabited them. St Ambrose of Milan also noted that it was Helen’s continual prayerful appeal to God that in whatever task she or Constantine would undertake, would first be offered to God’s discernment, especially Constantine to receive divine favour in battle and be delivered safely and without fear of danger. Who else would be better for Constantine to appoint, to head the fact-finding mission of the Holy Sites of Palestine and overseer any subsequent building works? St Helen’s fervent prayers to God to bless and approve all her undertakings or her desire to make the pilgrimage, naturally made her the appropriate candidate who would ensure that Constantine’s commission would proceed in a proper, dignified and God-pleasing manner. This was particularly important, given that the task was not going to be an easy one, since many battles had ravaged Jerusalem, which had been replaced by a new city named Aelia, that the Romans had built some generations previously. Even the journey to the Holy Land was marked with its own drama, for when she departed from Drepano (Bithynia) on the Asiatic shore of the Marmara Sea, the ship was assailed by storms and difficulties all the way to Palestine. Yet the aged augusta remained resolute for her life-time’s desire and pious wish was finally coming to fruition. Upon her arrival at Jerusalem she had to seek out the site of Golgotha and the Resurrection, which according to Roman chroniclers had been concealed by being buried under earth that had been brought by pagans, and on which various emperors had deliberately built pagan temples and statues upon, so as to deny Christians access to these Holy Places. Sozomen even mentions the construction of retaining walls to hold the earth in place and other walls to enclose the area, while the pagan temple was dedicated to Aphrodite, so that Christians who would go to reverence the Holy Place would appear to be venerating Aphrodite and accepting some of the immoral rites that took place there. Even when Jerusalem was destroyed and rebuilt by the Romans, Golgotha and the place of the Resurrection was still used as a site for the disposal of the city’s rubbish. St Jerome also noted that the Emperor Hadrian had deliberately sought to offend Christians and profane these sites by having idols raised all over them with a giant statue dedicated to Venus (Aphrodite) upon Golgotha, while at the Resurrection he raised a giant statue of Jupiter (Zeus). St Paulinus, Bishop of Nola, explained the reason of Hadrian’s intent was to deny Christians access to the sites most sacred to them, profane those sites, but most importantly as he saw it, to destroy the root and foundation of the Church by the cult of the idols. In a sense to invoke the power of the pagan deities to destroy and overcome the presence of Christ in these places sacred to His Incarnational ministry. Of course St Helen was armed with some basic information about these efforts to conceal and profane the sacred sites of Christianity, and had secured imperial approval and funding in order to remove these pagan places of worship and construct churches in these locations. The most difficult of all locations to discern, were those sites within Jerusalem. On this, St Helen had only two key sources of information to rely upon. The first was that of local knowledge and Christian pilgrimage practices. The difficulty with this source, was the lack of reliable informants who could be found; since the passing of many years and the formation of innumerable superstitions and embellished folkloric stories, had removed all dependable recollections or interest in religious awareness or observance. Thus, St Helen could only take with fistfuls of truth, what local knowledge had preserved. The other source of information on which she could turn to, was that of physical evidence in the form of archaeology or documentation, particularly town plans, civil engineering reports or military maps. Naturally within this search, and always engaged within prayer, St Helen especially sought out the learned from all religious and cultural backgrounds, particularly with respects to the sites of Golgotha and the Resurrection. Yet God in His infinite providence, secured for St Helen the help of a certain Jew named Judah, who had reliably preserved the ancient legacy of the site of the Crucifixion of Jesus of Nazareth, and who pointed out the east side of the burial cave of Christ. “Behold the place of combat: where is thy victory? I seek the banner of salvation and I do not find it. Shall I, be among kings, and the Cross lie in the dust? Shall I be covered by golden ornaments, and the triumph of Christ by ruins? Is this still hidden, and is the palm of eternal life hidden? How can I believe that I have been redeemed if the redemption itself is not seen? I see what thou didst, O devil, that the sword by which thou wast destroyed might be obstructed. 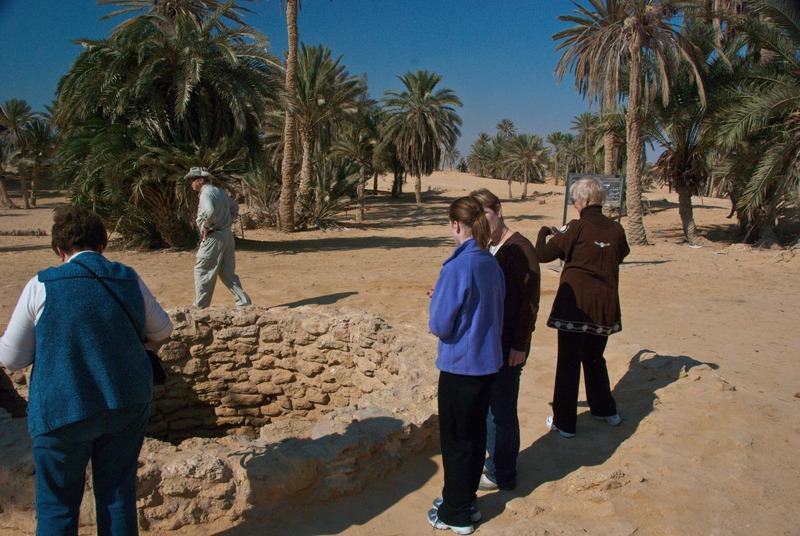 But Isaac cleared out the wells stopped up by foreigners, and did not permit the water to lie concealed. So let the ruins be removed, that life may appear; let the sword by which the head of the real Goliath was cut off be drawn forth; let the earth be opened, that salvation may shine out. Why didst thou labour to hide the wood, O devil, except to be vanquished a second time? Thou wast vanquished by Mary, who gave the Conqueror birth. Without any impairment of her virginity, she brought Him forth to conquer thee by His crucifixion and to subjugate thee by His death. Today, also, thou shalt be vanquished when a woman discovers thy snares. That holy Woman bore the Lord; I shall search for His Cross. 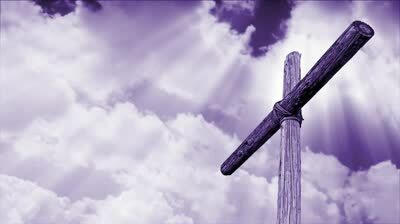 She gave proof that He was born; I shall give proof that He rose from the dead. She caused God to be seen among men; I shall raise from ruins the divine banner which shall be a remedy for our sins”. Thus soldiers and civilians were recruited for the task, and we are told by some anecdotal accounts, that digging operations proceeded quickly because those who were excavating kept on discovering gold and silver coins in the earth that gave them incentive to dig further, but apparently were dispersed by St Helen when the workers were not looking! In any case, after weeks of excavations, in a lonely and abandoned area nearby, littered with disposed stonework from construction conducted in Hadrian’s time, there grew a strange and unidentified plant. St Helen noticed this unusual plant which was the only thing growing within the vicinity and appeared to grow nowhere else. Her curiosity was intrigued by this rare unidentified plant, and enlightened by God, gave commands for it to be dug up, preserved and propagated. 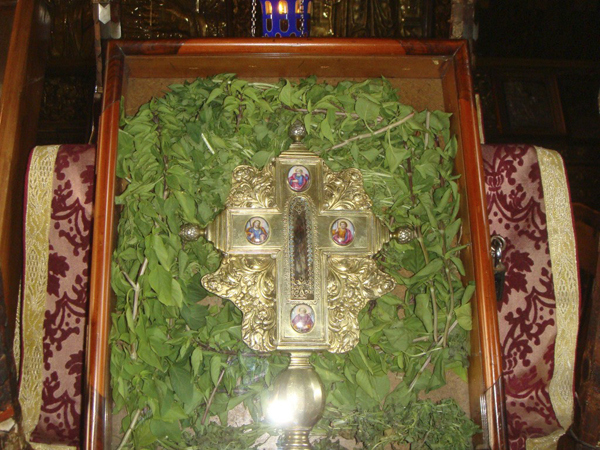 The plant in question, was named “Vasilikos” (Basil), which means “royalty” because it was found on the site of the true King of Kings, the Crucifixion of the Messiah. This plant is the herb colloquially known to us as “Greek Basil” because since that day some 1,600 years ago, “basil” has been the official flower of the Orthodox Christian Church. 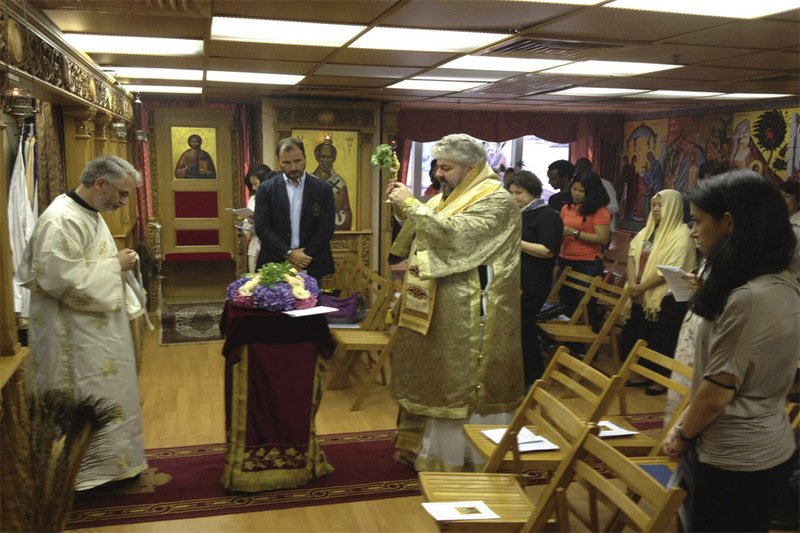 In any case, Orthodox priests use basil (whenever it is available) to bless homes or during church services where the blessing of the waters (aghiasmos) takes place. In returning to St Helen, after the basil was removed, she gave instructions that on the same spot, excavations should commence. Within the various synaxaria accounts of this feastday, they all make mention that as the diggers went deeper into the earth, they began to detect a fragrant scent emitting from underground, which became stronger and overwhelming the deeper they went. According to some anecdotes, there were workers who could not handle the ever-strengthening sweet fragrance and sought to abandon their task, but St Helen directed them to redouble their efforts and continue. Finally, the workers came to a point where they found a cavity and opened it up, where they discovered three crosses, a placard and nails. This is what St Helen expected, through deep excavations because it was the custom in earlier times, to bury the implements of torture close to the site of suffering; and given the controversy surrounding Christ’s ministry and crucifixion, concerted effort would have been made (as it was) to bury these implements that testified to Christ’s existence and unjust crucifixion, to which 300 years of successive generations of anti-Christian Jews and Pagans would add further to burying these items. Nonetheless, they were rediscovered in spite of these efforts, but the problem arose as to which of the three crosses was that of Christ, since the placard with its inscription had been removed from the Cross. The three crosses were virtually indistinct from one another, even though the placard attested to the fact that one of the crosses was Christ’s. Thus, the thanksgiving that St Helen and the faithful who had gone to observe amongst the crowds watching excavation works, turned to concern and fear. Because St Helen and the faithful who had doubts in their own ability to discern which cross was Christ’s, and they feared that they might accidently choose the wrong crucifix, and hence offend God, or discard the genuine article in place of one of the crucifixes of the thieves. Agitated by the devotion of her heart, the elderly St Helen offered fervent prayers and descended into the pit, clearing away the dust from the three crosses. Inspired by the Lord, she recalled to memory the Scriptural account of Christ’s Passion, and that the middle beam should be that of Christ’s, since the thieves were crucified either side of Him. Yet she pondered that the debris which had buried the crosses could have easily mixed them up. She used her sound reasoning to examine the crosses carefully to see where the placard had been nailed into, as well as any other tell-tale sign that might reveal the identity of the true Cross. 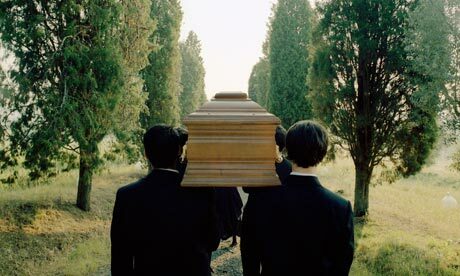 Providentially, while the crowd were distracted by St Helen’s examination, St Macarios observed the presence of a funeral procession that was taking place nearby and brought it to St Helen’s attention. She gave command that the deceased man, to the chagrin of the mourners, be brought to the excavation site, so that by a possible miracle, God would reveal to all present which was the true Cross. The corpse was taken off its bier and placed on the first and then the second cross, but as Sulpitius Severus relates, “death spurned the wood which had supported the guilty”. Finally the corpse was placed upon the third cross, and death was shaken off, as the Lord’s Cross was revealed by a resurrection before a great crowd. The crowd of the living began to tremble before this sight, while the dead man stood up and began screaming praises to God. Judah who was one of the onlookers present at this miracle, and beholding this great sign of God, requested St Macarios to baptise him, and so he received the name Kyriakos (meaning “of the Lord’s”). History remembers St Kyriakos as the successor of Bishop Macarios as Patriarch of Jerusalem, and who together with his mother Anna, suffered and was martyred in the reign of Julian the Apostate, and is commemorated by the Church on the 28th October. Yet our blessed father amongst the Saints, Bishop Macarios, sought to affirm the identity and veracity of the Lord’s Cross further. Within Jerusalem, there was a well-known case of a certain lady of considerable rank, who was afflicted by an incurable disease that had brought her to the point of death. St Macarios had convinced St Helen to issue an order to bring the bed-ridden woman to the site of Golgotha so that she may receive healing and confirm the identity of the Cross which raised the dead man to life, as the Cross of Christ. The invalid woman was brought upon her bed to the site of Golgotha, where Bishop Macarios signified by signs to the onlookers his intentions to confirm the identity of the Cross via healing the woman of her disease. He approached the bed-ridden woman in turn with each of the crosses. When the two crosses that they asserted belonged to the thieves came in contact with the dying woman, it seemed both folly and mockery to her, that she would be healed by some old wooden planks of torture. Yet when St Macarios brought the Cross, that raised the dead man to life, into contact with the dying woman, she suddenly opened wide her eyes, regained her strength and arose from her bed in complete health. The crowd of onlookers had grown immensely, as virtually all the inhabitants of Jerusalem and the nearby villages had emptied and poured into the area around Golgotha. The Christians of the region who were within the crowd kept on pressing closer to see the holy wood and seeking to get close to St Helen and beseech her for a piece of the Cross. Seeing the restlessness of the thronging crowd, St Helen became concerned, since out of unrestrained zeal, the crowd might seize the Cross and even cut it up. She posted more soldiers to guard the Cross to prevent people from breaking off pieces for distribution. The crowds implored St Helen, that if they were not permitted to take a piece of the Cross, then they should be afforded the blessing to behold it. Orders were given to construct a high ambon (pulpit) which Bishop Macarios ascended taking hold of the precious Cross, and raised it aloft in all four directions, just as priests do today. When the people beheld the Cross raised on high, they wept and cried aloud, and with a great unified voice proclaimed “Lord have mercy”. This was the first Exaltation of the Lord’s Cross in 326AD (the year believed to be the date of the Crucifix’s discovery). Naturally St Helen sought to place the Cross in worthier surroundings by the foundation of a basilican church on the site of the Passion. She named the basilica “New Jerusalem” and designed it to have a gleaming gilded ceiling, rich golden altars and a hidden sanctuary for where the Cross was kept and preserved. The Cross was only taken out on the feasts of the Exaltation, Holy Friday and Pascha, and it would be carried by the local bishop leading a procession of the faithful. At all other times, the Cross remained within the hidden sanctuary, unless with the dispensation of the local bishop who allowed pilgrims from far off lands to venerate the Cross. And it was he, by his generosity who would allow a shaving or splinter from the Cross to be bestowed upon the pilgrims, thus inspiring St Cyril of Jerusalem’s comment to cite, “…the whole world has since been filled with pieces of the wood of the Cross”. To which St Paulinus notes has “…lent its wood to countless, almost daily, prayers of the people. Yet it suffers no diminution”. In any case, to inform her son of the great discovery of the Cross of Christ, St Helen commanded that bonfires were to be lit on hill and mountain tops from Jerusalem all the way to Constantinople. The epilogue to Constantine’s commission and St Helen’s execution of that directive was that she remained in Palestine for 2 years, travelling its length and breadth while overseeing the construction of churches upon the various sites sacred to Christianity. After this, St Helen travelled across the East to bestow benefactions upon Christian communities and churches there, in addition to extending much charity to people in need whether poor, hungry, naked or paid for the freedom of those in servitude. It is said that by her philanthropic ministry and example, many people were inspired to follow a higher calling in life or to even seek baptism. Yet, it is one act of hers, which has become a sign, symbol and practice even within our own times that marks the kingship of Christian nations. It is said that after encasing one of the nails from Christ’s Cross as a holy relic to be used in devotion, she melted another nail to make an imperial diadem which became the crown of Byzantine emperors. It was thus a symbol of kingship that became necessary for imperial succession, just as the stone of scone is important for the crowning and succession of a Scottish monarch, or the throne of Edward the Confessor for an English monarch. Yet the design of St Helen’s diadem was shaped like a hill that was surmounted by a crucifix. The symbolism of course representing the hill of Golgotha, and the Cross being that of Christ’s, under whose sign Christian monarchs exercise authority and under whose sign they are bound to serve the nation and its people. The other key event to which the feast of the Exaltation of the Holy Cross is connected with, occurs some centuries afterwards, with the murder of Emperor Maurice by the tyrannical usurper, Phocas. Now Phocas, as is well documented by chroniclers and historiographers, could easily be characterised as the “Hitler” or “Stalin” of the Byzantine Empire, whose trademark of violence and brutality encompassed every aspect of his reign. No one was immune or safe from the full force of his tyrannical authority both within and beyond the empire. His systematic “purges” of the population, his ineptitude in managing the empire’s finances and squandering its resources caused widespread poverty to which he then added the burden of excessive increases in taxation. Phocas of course sought to coerce the Church to comply with and bless his “directives”, but many within the Church’s ministry stubbornly resisted, to which torture, imprisonment and death was meted out to them. Yet the murderous reign of Phocas (602-610AD) set in motion a chain of events to which the empire had to face. The first was the invasion and settlement of the Slavs into the Balkans, and the invasions of the Avars. 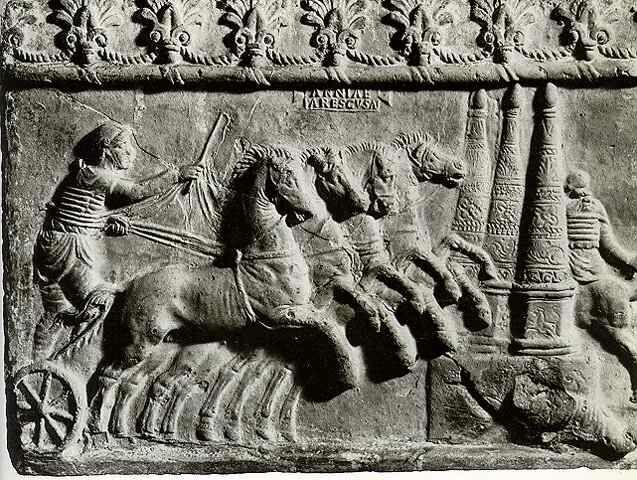 The other, was far deadlier, which was war with the other great “super-power” of that era, Sassanian Persia. The cause of that war stemmed from the fact that Emperor Maurice had sheltered and mentored Chosroes II (Khozroes) like a foster father, and had provided him the means to retake the Persian throne. Naturally, Chosroes was a close ally of Maurice, to whom he held in great esteem and love, and with whom he concluded a series of peace treaties. 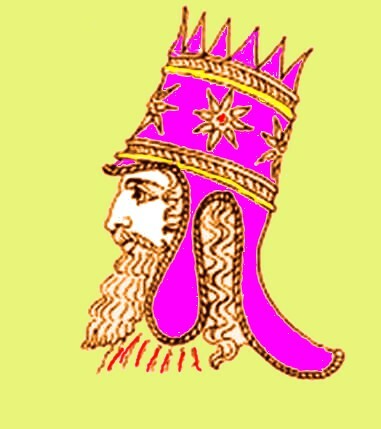 Yet as Persian chroniclers cite, Chosroes was a tyrant much like his Byzantine counterpart Phocas, and so when he learnt of the murder of Maurice he seethed with an inflamed thirst for revenge. But which gave way to his brazen self-serving opportunism to break Persian treaties with Byzantium, and seize whatever he could, since Phocas had weakened the Byzantine realm. 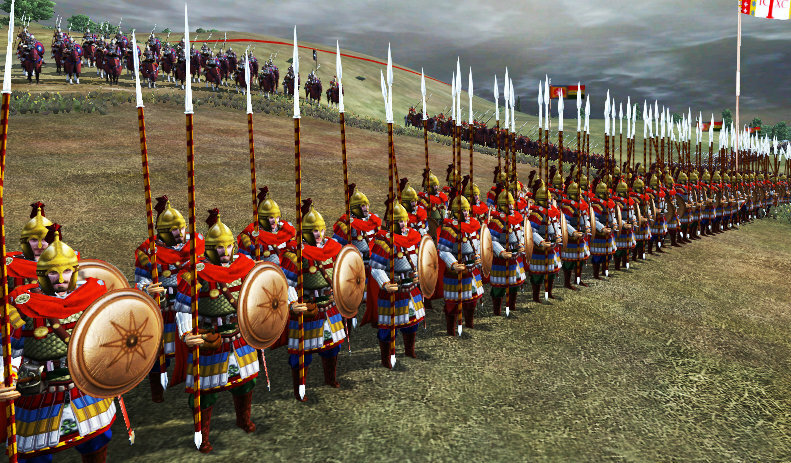 Thus the Persians declare war and won many battles against the disoriented, disorganised and weakened Byzantine armies. The Quranic Surah (30) entitled “Al-Roum” (translated as “The Romans” or “The Greeks”) makes specific reference to this titanic struggle and the shockwaves caused by the Persian victories: “The Romans have been defeated. In the nearest land (Syria, Iraq, Jordan and Palestine), and they, after their defeat, will be victorious. Within 3 to 9 years. The decision of the matter, before and after (these events) is only with Allah, (before the defeat of the Romans by the Persians, and after the defeat of the Persians by the Romans) And on that Day, the believers (Muslims) will rejoice (at the victory given by Allah to the Romans against the Persians)…” – Surah 30, Ayats 2-4. In any case, the ensuing chaos in the aftermath of these defeats, saw the Persians seize Palestine, Syria, Jordan and Egypt. Times were difficult given that the Monophysite controversy had been raging since the time of Justinian, the plague had wiped out one third of the population, recession, high taxation and the earlier wars with Persia had pushed people to breaking point. In spite of this the Persians exacted tribute out of these newly conquered people, plundering what little they had, and desecrating many Christian Holy Sites, often stealing precious relics and liturgical items. Of particular importance, was the seizure of Patriarch Zacharias of Jerusalem and the Holy Cross, as a means to humiliate Christendom and taunting the Byzantines; even threatening to destroy all that they had acquired (including the Cross, which they later tried to ransom) if any steps were taken against Persia. However for the Persians, the outcome of carrying off the Cross to Persia witnessed the Church of Persia to grow in leaps and bounds with an ever-increasing number of Persians seeking to learn about and even become Christians. 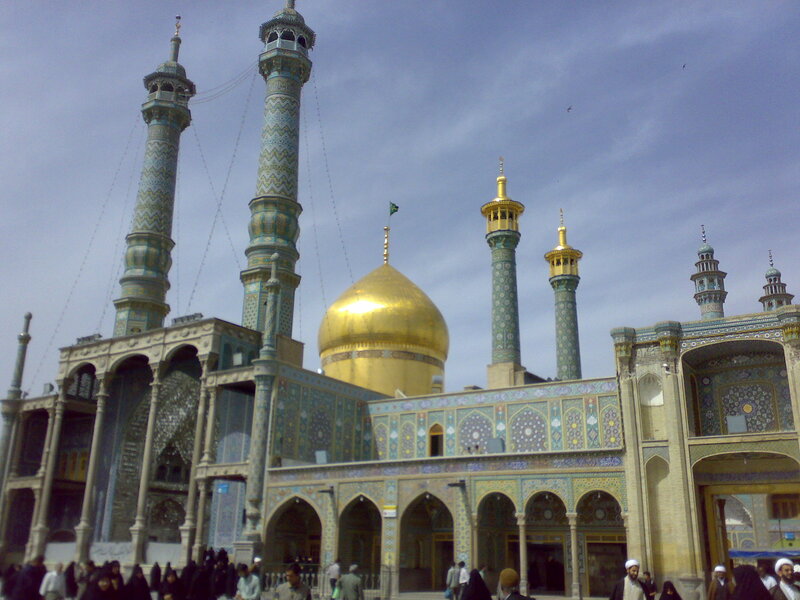 Rather than humiliating the Christians, the Persian civil authorities and the priestly caste realised their folly and were compelled to take drastic actions against a grassroots movement that threatened to engulf Persia and turn it into a Christian nation. During this period of Byzantine setbacks, the military commander Heraclius, with the aid of the army, deposed Phocas and was crowned Emperor on October the 5th, 610AD. Heraclius had the unenviable task of setting about re-establishing law and order, while fending off the Slavic and Avar incursions into the empire. However, he also knew that he needed to have a “reckoning” with the Persians, to liberate those peoples subject to Chosroes’ tyrannical rule and persecution. And most importantly to secure the return of peoples and sacred items, especially the Holy Cross, to their places of origin. 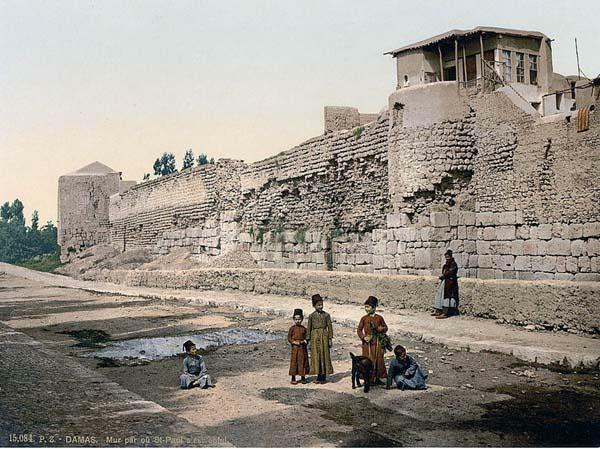 The memories of the fall and destruction of Damascus in 613AD, followed by the fall of Jerusalem in 614AD, weighed immensely upon Heraclius’ conscience. Jerusalem’s demise was particularly a bitter memory, since the city’s inhabitants rose up against and killed the entire occupying Persian garrison. To which Chosroes despatched another garrison to occupy Jerusalem and slaughter 90,000 of the city’s inhabitants, only sparing the city’s Jews who according to Persian, Byzantine, Arab and Jewish chroniclers had aided the Persians in their conquest. The seizure of Patriarch Zacharias and the Holy Cross crowned this most painful event, reemphasising the need for Heraclius to reckon with the Persians, who had begun forming alliances with the invading Slavs and Avars. In the meantime, the Holy Synod of Jerusalem had to elect a caretaker Patriarch in the absence of St Zacharias, who could help restore Church life and rebuild the many shrines and churches damaged or destroyed by the Persian invaders. The man selected for the task was the holy Modestos II whose memory is commemorated by the Church on 16th December. St Modestos set about his task of restoration immediately, giving particular priority to rebuilding the ruined Church of the Resurrection that the Persians had ransacked. He also initiated and facilitated the return of the local Christians back to their homes who had been driven away or taken hostage. From surviving accounts we are told that St Modestos paid the ransom for many of the hostages or secured their release through tact and diplomacy. He went about giving comfort to those who had been traumatised by the recent events and to the afflicted he gave strength and courage. He secured the bodies of the holy fathers of St Savvas Monastery, who had been slain by the Persian raiders, and gave them an honoured and fitting funeral and burial. This and many more things the blessed St Modestos did as part of his ministry to rebuild and maintain the stability of Church life; especially given that Chosroes had enacted a series of prejudicial laws and directives for the systematic purging of Christians in Persia and in all the newly conquered territories. 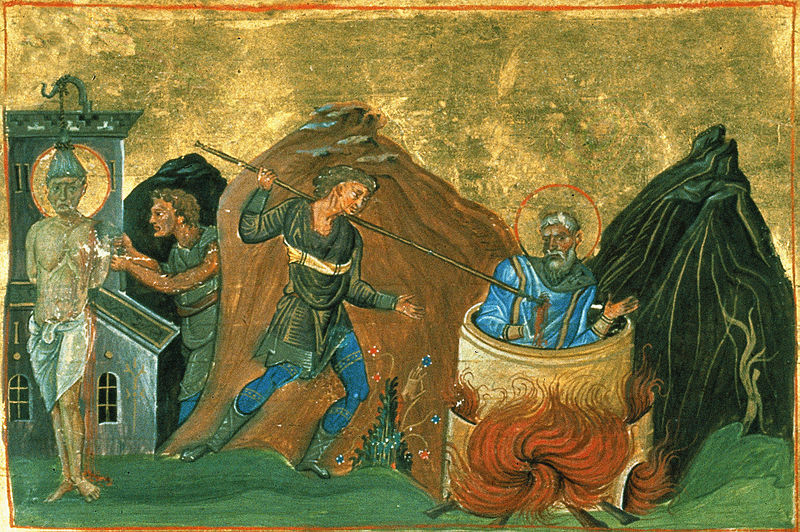 From Palestine to Persia, from Egypt to Syria, the Church witnessed another era of martyrdom. 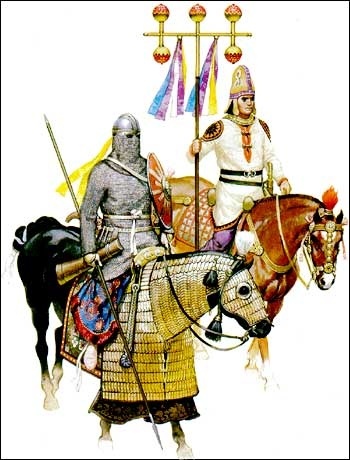 As for Heraclius who had been waging war against the Slavs and the Avars, he had been making preparations for war against Persia while fending them off from invading Asia Minor and linking up with the Slavs and the Avars. After eight years of going backwards and forwards from one front to another, he was ready to take the field against Chosroes. He waged six campaigns from 622 to 627AD, inflicted devastating defeats upon the Persians and annihilating their armies. It was as one Persian contemporary put it, “the beginning of the end”. Yet Chosroes and his generals had only one hope to fend off and put Heraclius on the defensive, by circumventing Byzantine forces and invade Asia Minor. Their objective was to besiege Constantinople and meet up with the armies of the Avars to eliminate Byzantium once and for all. Despite being a gamble, the strategy had sound merit because Chosroes knew that Heraclius was sacrificing the battlefront against the Slavic and Avar invaders by drawing men and resources to fight Persia. This stratagem was put into action in 626AD, where Chosroes’ armies had reached the Bosphoros shore opposite Constantinople and threatened to succeed in linking up with the Avars who were encamped to the City’s north on the Thracian shore. By the grace of God and the ability of Heraclius, who had to retreat to defend his capital, he fought them all off and defeated them. Heraclius then began the final march towards Persia, that would be the fatal deathblow to Chosroes (and in hindsight we can also say, Pre-Islamic Iran). 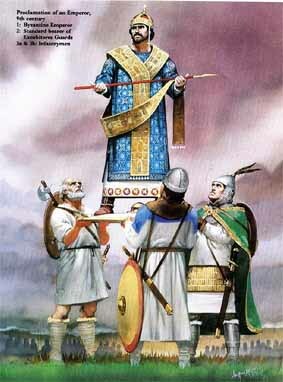 On the 1st February 628AD, Heraclius finally besieged and occupied Dastargerd (Dastagird) which was Chosroes’ favourite imperial residence; and from which he made a hasty retreat, but all in vain for prior to the conclusion of March, Chosroes was killed by his own son, Kawad Sheroe (Siroes), who negotiated peace with Heraclius. As part of the peace agreement, the Persians surrendered all their conquered territories and captives, as well as the return of all looted treasures and sacred items, including the Holy Cross. Heraclius returned to his capital in great triumph and public accolade, but as onlookers observed (and noted in Synaxaria accounts also), that the pressures and military campaigns since his ascent to the throne, had taken their toll, for he was a man in his mid-fifties but appeared older, worn out and ill. 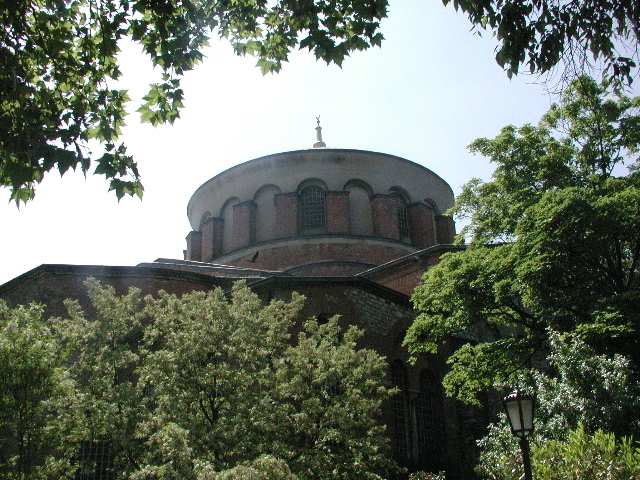 The thanksgiving service that was held in Constantinople, presided over by Ecumenical Patriarch Sergios, which began as a procession from Blachernes to Hagia Sophia where Matins, and the service of the Elevation of the Cross took place. And in imitating the liturgical custom of Jerusalem, Patriarch Sergios ascended an ambon that had been set up in the centre of Hagia Sophia, and raised the Cross at the four points of the compass, while the choir chanted “Lord have mercy”. 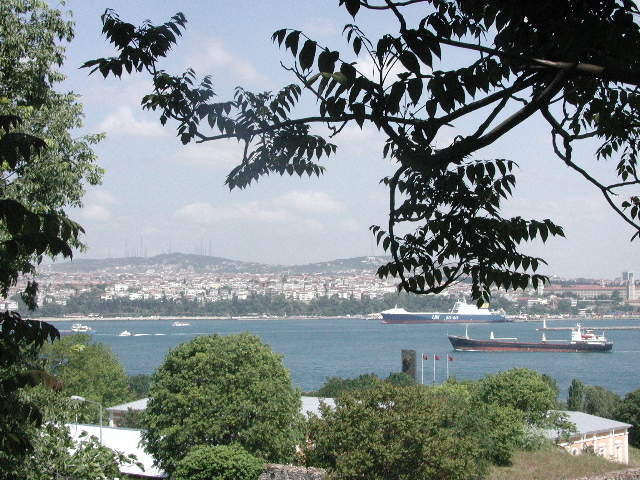 The Cross remained in Constantinople till arrangements could be made for its safe return to Jerusalem. Then, on March 21, 630 AD, Heraclius left with his wife Martina for Jerusalem. Upon their entrance into the Holy City, there was much joy, hardly anyone could chant from the great emotion. Heraclius himself was carrying the Cross on his back when, suddenly he could not take another step. Patriarch Zacharias then beheld an angel directing Heraclius to remove his imperial robes and to walk barefoot bearing the Cross. Disclosing the vision to Heraclius, the emperor straightway stripped his raiment and donned poor clothing. Heraclius then restored the Holy Cross to Golgotha, to the joy and consolation of all Christendom, and returned all the church objects, each to its place. He then distributed gifts to all the churches and to the inhabitants of the Holy City. Thus, that same year when the actual feast of the Exaltation of the Holy Cross took place, the feast had acquired greater meaning to the people of the Holy Land and all of Christendom. 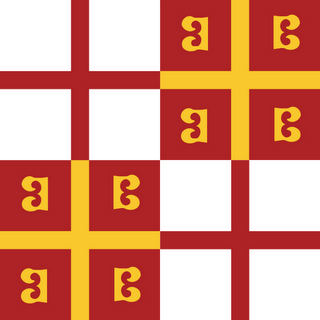 The feast’s dual religious and political character and importance had finally been cemented, and in laymen’s terms became Byzantium’s own “National Day”. And by extension, the feast is also the national day of all Orthodox Christian nations and empires. But it is also a reminder to Christians everywhere, that all of humanity is dependent upon and beneficiaries of Christ’s selfless ministry of salvation. This significance became ever manifest, not too long after the restoration of the Cross in Jerusalem, because as Heraclius and Chosroes fought each other in 626AD, they had both received letters from the Quraysh Arab, Mohammed of Mecca, who had invited them to adopt his newly founded religion of Islam. Naturally the two kings and their peoples, did not take much notice of this merchant who the Meccans and Arab poets had branded as a “deceitful and deranged coward whose followers attacked defenceless and unarmed communities and caravans in the dark of night”, because they and their nations were too preoccupied by war. Yet the deprivations of the past century had wrought their effects upon Byzantium and Persia, from plague, war, barbarian invasions, religious controversies and economic depression which had stretched the limits of endurance of both empires. And it now afforded the followers of Mohammed, who had defeated the Meccans via hit and run raids, to look beyond Arabia for conquest, loot and the imposition of their imperialistic ideology of apartheid for: “Fight against those who believe not in Allah, nor in the Last Day, nor forbid that which has been forbidden by Allah and His Messenger (Mohammed) and those who acknowledge not the religion of truth (Islam) among the people of the Scripture (Jews and Christians), until they pay the Jizyah tax with willing submission, and feel themselves humiliated”, – Surah 9 (A-Taubah) Ayat 29. Numerous historiographers tend to agree, that the year 629AD, when the Mohammedan Arabs begin their “war” of conquest and against “unbelief” beyond Arabia by raiding the Ghassanids of Jordan who were a client kingdom of Byzantium, and that 629AD and the following 30-40 year period, was the only historical opportunity to which the semi-nomadic Arabs could possibly succeed in conquering settled, advanced civilisations. Their use of genocide, terror tactics and piratical raids against unarmed and innocent civilians, as they had employed in Arabia, sanctioned by the Mohammedan protocols of war, caused many people to flee and take refuge in major walled cities for protection, while many of those war-weary cities opened their doors to avoid additional bloodshed. 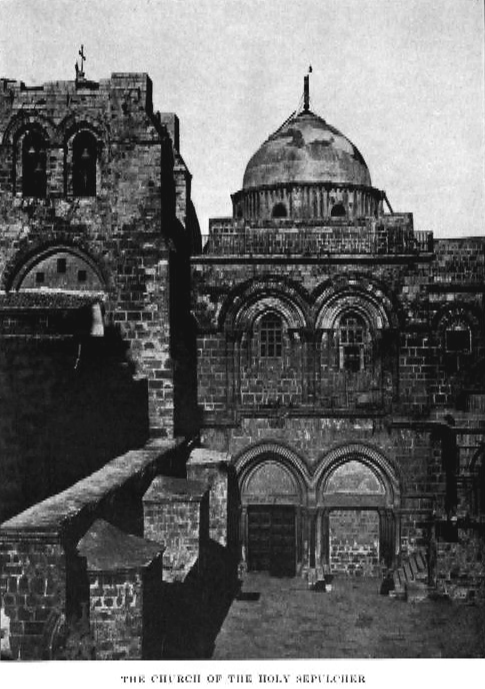 The city of Damascus, after a long siege, opened its doors to the invader in 635AD, by order of the local military commander (who subsequently, was the grandfather of St John of Damascus). By this time Heraclius had removed the Cross from Jerusalem and taken it to Constantinople for safekeeping, but with the fall of Damascus he was prompted to consult the people and the Patriarch of Jerusalem to consider the cutting of the Holy Cross into segments, and its distribution throughout the world to ensure its survival. With a heavy heart, the people and the Patriarch of Jerusalem took the fateful decision to agree to Heraclius’ proposal, and so they received back a piece of their beloved Cross. As difficult as the decision may have been, it proved to be providential, because in 637AD Jerusalem fell to the Mohammedans; and so the feast of the Exaltation and Elevation of the Holy Cross became a more mainstream ecclesial feast within Christendom, since Christians gained pieces of the Holy Cross and learnt about the fall of Jerusalem, and so they endeavoured to preserve and perpetuate the feast. It thus served as a reminder to Christians, no matter where they dwelt, that there is no permanent human order or authority that endures forever or is immune to corruption, decay and destruction. The only thing that is permanent, was and is God, and His infinite, firm, but merciful love. As for the figure of Heraclius, his wars against the Persians, as well as his careful diplomacy had been able to cultivate a sense of solidarity and begin the process of reconciliation amongst Christians who were bitterly divided into two factions over the dogmas of Christology, namely the personhood and natures of Christ. The Church was evenly divided between the two factions, those who were advocates of the Christology of the 4th Ecumenical Council of Chalcedon (451AD), and the 5th Ecumenical Council of Constantinople (553AD), and those who were opposed to either council. It is here we should mention that Church synods such as those of the Ecumenical Councils, did not “innovate” or “develop” “new ideas of theology” as quite a number of foolhardy or ignorant scholars like to assert. Their purpose was to discern and articulate what was the Christian Faith and teaching, especially on dogmatic matters of deep theology. They cross-referenced their examinations slowly and carefully against the witness of Scripture, Apostolic Tradition and inheritance, liturgical practice, patristic teaching or commentary and so forth. They utilised all these approaches to ensure that they were not erring or diverging away from what Christ taught. With specific reference, the 4th Ecumenical Council condemned the teaching of Monophysitism, which asserted that Christ had one nature, that is divine, which “subsumed” or “absorbed” Christ’s human nature. The 5th Ecumenical Council on the other hand, dealt with Monothelitism, which was the assertion that Christ had both a human and divine nature, but had one overriding divine will that commanded both natures. From a theological perspective, these two councils had articulated the Christian belief of the Undivided Church and helped resolve the “Christological issues” that people were arguing over, and by which both sides could agree to. However, as is usual with the imperfections of human character, ignorance and the “kinks” of historical circumstances, the opponents denied the validity of these councils. The opponents questioned their “ecumenical” character because of the manner in which they were convened, along with ignoring or being misinformed of its proclaimed dogmas. As for the adherents of the two Ecumenical Councils in question, they branded and denounced the opponents for not heeding the conclusions drawn from the councils, rather than adopting a firm but conciliatory stance. Unfortunately both sides, against the teachings and beliefs of the Church, turned to political and military means to resolve their differences, to which the Mohammedans exploited to great effect, and justified their conquests. Probably the most shocking and calamitous of these “resolutions”, was without doubt the opening of Egypt to the new barbarian invader. Egypt, the empire’s granary and one of its main centres of monastic spirituality became the centre stage for the Christological disputes. The country was evenly divided between those who were advocates of the Chalcedonian view, and those who opposed it. Historiographers highlight that what added weight to the problem, was that many of the deliberations of the 4th Ecumenical Council had not become widely circulated or translated as yet, thus compounding the existing problem. We also know that the Church leadership of Egypt was Greek speaking on both sides of the “theological divide”, and it was not a case of “imperialistic Greeks” lording it over the native Egyptians as some claim. The difference amongst them lay squarely upon their knowledge and use of Greek, for many utilised the language of the Alexandrine schools of philosophical and theological discourse, which differed from that employed by the 4th Ecumenical Council. Hence the opportunity for misunderstanding amongst brother Christians was already entrenched from the start. To further complicate matters the emergence of a new generation of ecclesial hierarchy in Egypt, who were not as well versed in the diversity and richness of Greek philology or the subtleties of Alexandrine thought, and quite ignorant of other schools of thought beyond Alexandria, begin to succeed in vacant sees. 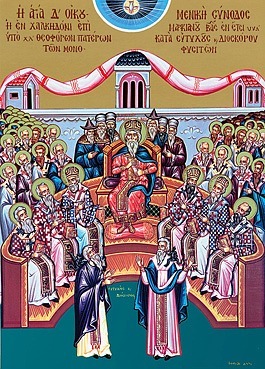 To this generation of hierarchs the 4th Ecumenical Council was a “veiled” form of the heresy of Nestorianism, which if one examines the deliberations of Chalcedon show that it was not. This was coupled with a sort of triumphal religious particularism about the Patriarchate of Alexandria which had begun to take shape, since there was immense pride amongst the Christian hierarchy of Egypt, in the fact that Alexandria had stood firm in expositing the Church’s dogmas against Arianism and Nestorianism; especially via the respected persons of Sts Athanasios the Great and Cyril of Alexandria. Of course it is only natural for people to feel honoured by the fact that their own ecclesial communities and context brought forth such personas of immense spiritual and dogmatic influence, and to know that their Church had been able to stand firm against those who sought to destroy Christianity. Yet this created a false confidence in thinking that the deliberations of the 4th Ecumenical Council was another attack on the Orthodox faith of the One Undivided Church, and to which Alexandria must once again defend from a new form of Nestorianism. The other key problem was discerning from amongst the opponents of Chalcedon, those who were in actual fact “Monophysites”, that is those who asserted that Christ had one divine and overriding nature, and those who were utilising Alexandrine theological terminology to respond to what they perceived as Nestorianism re-presented in a different form. 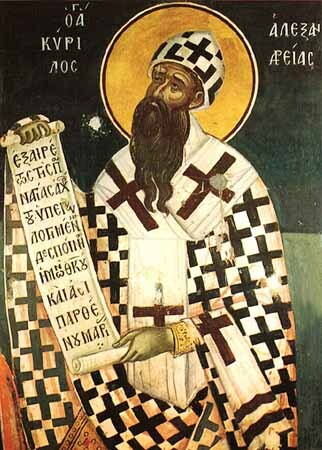 In both cases, both these groups of opponents would appeal to the teachings of St Athanasios the Great and even more so to St Cyril of Alexandria. The particular quote amongst the body of Cyrillian writings that they often quoted, and to which the Monophysites hid behind, was the one where St Cyril spoke in response to Nestorius’ teachings by saying that in Christ “there was one physis incarnate” (Μίαν φύσιν σεσαρκωμένην). 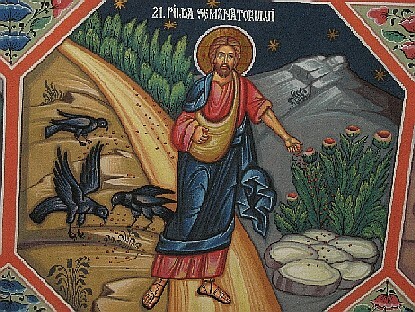 In the terminology of the 4th Ecumenical Council, or the Antiochene school of theological and philosophical thought, “physis” (Φύσις), specifically meant “nature”; whereas in the Alexandrine terminology as employed by St Cyril, the word means “personhood/hypostasis” or “being”. The terminology of Antioch and the 4th Ecumenical Council employed the word hypostasis (personhood – Υπόστασης) to explain how Christ’s human and divine natures coexist equally, and they used the word “physis” to mean nature. Thus the 4th Ecumenical Council proclaimed that Christ had two natures (physis), both human and divine, which exist in His one hypostasis (personhood). 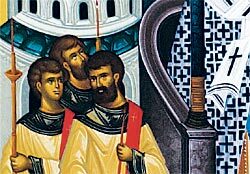 St Cyril’s famous line, which the Monophysites distorted the meaning to serve their purposes, actually proclaimed the same teaching of the 4th Ecumenical Council; that is, that Christ had one personhood or identity that became incarnate, not that Christ had one nature. If there was a difference between Cyrillian Christology and that of the 4th Ecumenical Council, it would revolve around the subtlety of preposition utilised to explain the unity of Christ’s divine and human natures, that of “from” (έκ) and “in” (έν). Because the 4th Ecumenical Council proclaimed that Christ had two natures which exist within His very being and hypostasis, whereas St Cyril states that Christ’s dual natures come from His very being and personhood (hypostasis). In spite of this theological truth and the 4th Ecumenical Council articulating the dogma of the Undivided Church, the presiding Patriarch of Alexandria, who was a “Chalcedonian”, was assassinated. He was then succeeded by a very politically shrewd opponent of Chalcedon, who opened Egypt’s doors to the Mohammedan invader. This successor had campaigned effectively in convincing a considerable swathe of Egypt’s Christians, as he believed also, that it was better to submit to the yoke of the new invader than to “compromise” the “opposition” to the Ecumenical Council of Chalcedon. This very point is well documented by Mohammedan Arab chroniclers and provided their justification for their invasion and subsequent “exploits” in Egypt. Yet the same chroniclers also mention, that this successor patriarch met with opposition from his own supporters, for his issuing the invite to the Muslims to enter Egypt, and his entreaties to the general populace to not resist the “welcomed guests”. Instead they called for dialogue to continue, especially given the wars into which Heraclius had sought to re-establish Christian solidarity. However as Muslim chroniclers point out, the successor patriarch of Alexandria had won over public support to his actions, and to which the initial lower levels of taxation to which the new Muslim overlords initially charged in comparison to Byzantium, confirmed that public sentiment. As for the Chalcedonian adherents of Egypt, they naturally did not recognise the validity of the patriarchal succession of Alexandria, especially due to the manner in which the predecessor had been disposed of, nor the dealings that his successor had made with the Muslim invaders, and so they elected another Patriarch of Alexandria. The Muslim chroniclers relate how this ecclesial impasse served their interests of divide and conquer perfectly, because the “Chalcedonian opponent” patriarchal successor petitioned the Muslim authorities to have him officially recognised as the legitimate Patriarch of Alexandria; and to eliminate all those “imperial” (“melkia”, that is the Chalcedonian advocates) Christians from the land of Egypt, and their episcopal successors. Thus seizing the opportunity to secure their rule, the Muslims began a wave of persecution to purge Egypt of Chalcedonian Christian adherents. Though they did not eliminate them altogether, so as to use their presence to manipulate or put pressure upon the Non Chalcedonian Christian hierarchy, despite having secured their fealty. Of course in time the Muslim invader applied their religious apartheid, and began to oppress the very people who had invited them into Egypt, for as the Muslim chroniclers relate that some 30-50 years into the occupation, Egyptians began to revolt against Muslim rule. Naturally these revolts were put down with immense brutality, as Egyptians sought at every opportunity to free themselves from the ever-increasing and burdensome levels of taxation, prejudicial laws and the enforced Arabisation and Islamisation of their nation. Such were the short-sighted policy of this “successor” patriarch, who indelibly drove a wedge between the process of reconciliation that Heraclius had sought to promote. The Muslim invasion and the persecutions helped create the emergence of two distinct patriarchates within Alexandria, that of the Coptic Orthodox Church that succeeded the opponents of Chalcedon, and those who advocated the Chalcedonian view which is the Greek Orthodox Patriarchate of Alexandria. It was because of the actions of such individuals, particularly those of influence, that undermined Heraclius’ efforts towards reconciliation and to rally the Christians in defence of the empire against the combined barbarian invasions of Arabs, Slavs and Avars; who all threatened the livelihood, well-being and Christian faith of each person of the empire, irrespective of whether they were advocates or opponents of the 4th and 5th Ecumenical Councils. The present-day trials and tribulations of Middle Eastern Christians, and their martyric witness since 629AD, affirmed Heraclius’ foresight in trying weld a unified and coordinated front against the Mohammedan invaders; who as history attested to, have replicated the same strategy of conquest and oppression against many other peoples and places from the Balkans to India to Sub-Saharan Africa. 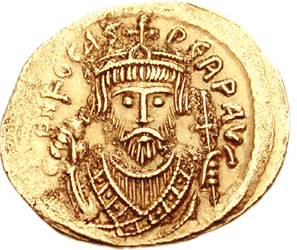 The other key legacy of Heraclius’ campaigns against the Persians, was a weakened Persia. Chosroes’ own reign of terror, especially his conquests and persecution of the Christians within Persia, helped aid this state of affairs. But in hindsight, the seizure of the Holy Cross, and keeping it in Persia brought about a renaissance within the Christian communities of Persia, and an ever-increasing movement amongst Zoroastrians to apostasise and become Christians. Despite bringing about this circumstance upon his own empire, Chosroes still insisted on the imprisonment, torture and killing of the ever-growing number of Christians, just as Diocletian had done in the Roman realm in earlier times. Thus Chosroes purged Persia of many able bodied people who could serve his empire. Many Persians, like earlier Roman counterparts had done, denounced their fellow citizens as Christians, even if the accused had no knowledge of Christianity at all and were delivered up for execution on false witness or evidence. In summary, the net result of Heraclius’ campaigns and Chosroes’ purges paved the way for two possibilities, since Persian imperial authority has seriously been eroded. The first scenario was the emergence of a Christianised Persia. 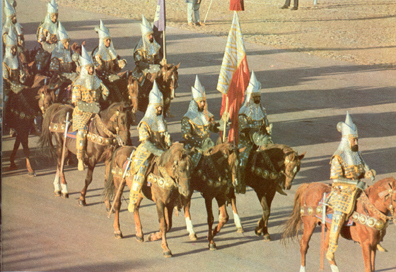 The second scenario became the historical reality, whereby the Mohammedan Arabs found a weakened Persia which they completely annihilated, enslaved and Islamised; while in Mohammedan Arab folkloric tales demonised the figure of the Persian, often casting them in roles of villainous sorcerers and so forth. As for Persian Christians, much like their Zoroastrian counterparts, were put to the sword and almost were made extinct. Yet the conquest of Persia, which is still bitterly remembered and commemorated by Iranians each year, also saw the emergence of the world’s first Non-Arab Muslim state, because the Persians eventually expelled their Arab overlords and had preserved their language and much of their culture. Thus, the Persians had not submitted entirely to Arab Muslim imperialism, but were distrusted for this very point as well as becoming the safe-haven, and later, empire of Shia’a Islam. The final point and legacy of these events that surround this unique feast of the Exaltation of the Holy Cross, was the nature of “Christian Holy War”. There are historians and Byzantists who, and with good reason, assert that Heraclius’ war for the Cross was the true and original “crusade”. However the Byzantine understanding and the later Papal influenced Western European understanding of crusade or “Christian Holy War” came to differ immensely. The foundation of going forth in the name and bearing of the Cross had its roots within the revelation of St Constantine, but it was Heraclius whose fight against the Persians to recover the Holy Cross was where this concept took real form. The objective of Heraclius’ “holy war” or “crusade” was not to conquer or kill, but an action taken in legitimate self-defence of the nation, its peoples and most importantly its holy sites and treasures like the Cross. Killing in battle though, was and is an inevitability of any armed conflict, but Heraclius’ campaigns demonstrate that this heinous crime against God should never be the objective or purpose of any war, that is killing for the sake of killing like genocides and massacres. In our own times, the placing of such parameters on the conduct of war has the example of the Geneva Convention, but of course in those days of Heraclius, the world was not as globalised as we are, nor were there any systems of international arbitration. Thus, the inspiration of Christian teaching and ideals helped develop the first tentative parameters upon a failing of humans to attain peace. 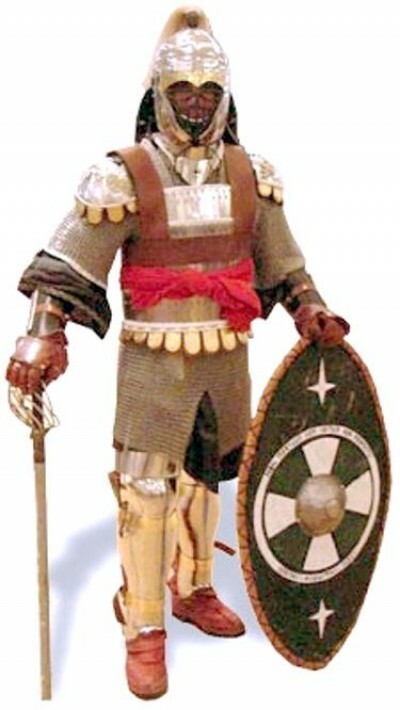 Yet unlike in our own times, Heraclius set down a norm for Byzantine military conduct in that soldiers were commanded to undertake a period of confession and penance for killing fellow human beings who are “born in the image of God” once the war was concluded, in order to be received once again for Holy Eucharist. Initially, this concept was to avoid “soiling” the sanctity of the Cross in whose name Heraclius sought to wage war against the Persians to recover. But it became the stock-standard practice for all armed conflicts in Byzantium, drawing its particular inspiration from Genesis, the Ten Commandments and Christ’s teaching of “what you do to the least, you do to Me”. 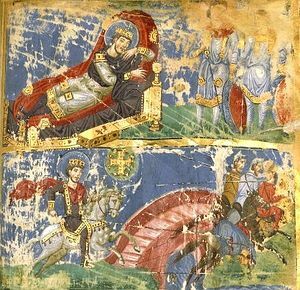 And this unique phenomenon in military history, whereby such a great premium was put on the sanctity of human life, marks out Byzantium right till its very end. Within Western Europe the only example of a crusade that comes close to the Byzantine conception of a “Christian Holy War” was the Iberian Crusade, better known to most as the Reconquista of Spain and Portugal to expel the foreign Arab-Moorish invader who had occupied the land and tyrannised its people with the same discriminatory apartheid as had been employed in the Middle East. 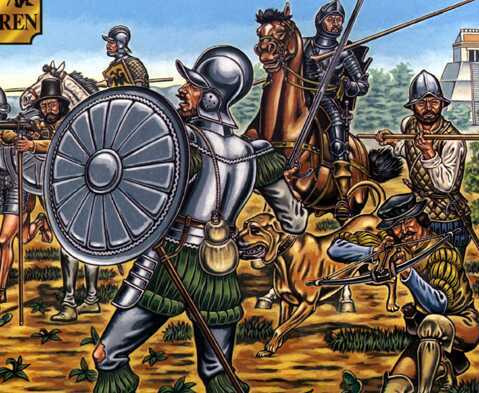 It was a war of liberation that took many centuries and drew many other Christian Europeans to come to the aid of the Spanish and the Portuguese, many of whom eventually settled down in those lands and intermarried with the Spanish and the Portuguese. Where “crusade” or “Christian Holy War” takes a radical shift within Western Europe was after the Great Schism of 1054, whereby Pope Urban II receives a letter (ca. 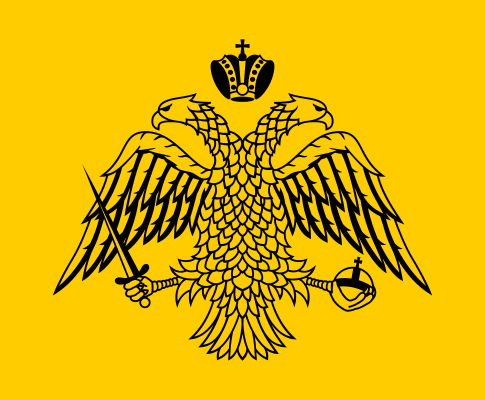 1090s) from the Byzantine Emperor, Alexios Comnenos, petitioning him to send soldiers to assist him to fight the Turks. 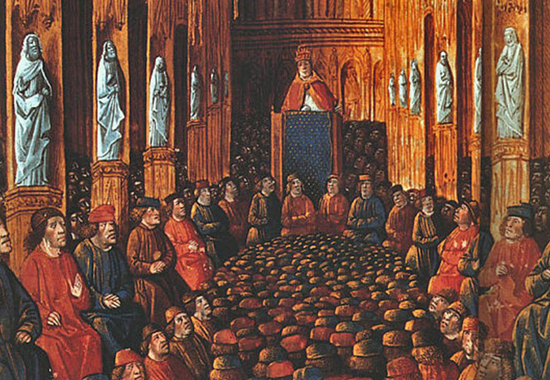 Pope Urban seized the opportunity to use this petition as a means to expand the scope of Papal authority and impose it physically within the East. He then gave his blessing to the indiscriminate killing of “non-believers” at the great Council of Clermont, and asserted that Christ had been misquoted, and thus it was not a sin to kill. In actual fact, the killing was the penitential act itself for the forgiveness of all sins! At this point, some Byzantine historians often question as to whether Urban’s directive was inspired by the feudal politics of Western Europe born in the times of barbarian invasions, or by the Islamic protocols of war. Whatever the case, Urban’s directive gave birth to the disaster of the Crusades and revived Islamic Jihadism, since there is much evidence from Muslim and Byzantine chronicles that indicate the decline of the Caliphate due to corruption and Muslim apostasy towards Christianity. Yet one of the first victims of the First Crusades were Byzantine and Oriental Orthodox Christians. 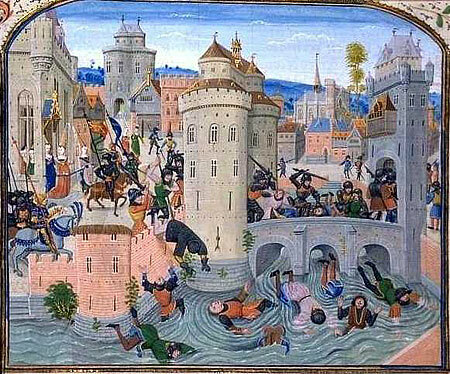 It is on record that on the First Crusade, the city of Semlin was burnt down over a dispute for a pair of shoes, Constantinople besieged during Holy Week, the environs of Nicaea’s native Greek Christian populace were massacred and pillaged, while the indigenous Christians of Syria and Palestine were tortured, killed or imprisoned (including the Patriarch of Antioch who refused to submit to Rome’s authority), and to crown this path of depravity, the destruction and massacre of Jerusalem and the burning down of the Holy Sepulchre. Naturally the massacres of Jews and Muslims are well known to most, but the “non-believers” to which Urban and other succeeding Popes and Crusader leaders attacked were Byzantine and Oriental Christians because they were not under Rome’s authority and refused to submit to Rome. Hence the First Crusade set the tone for all subsequent Crusades, and later on, the Western European “Christian” wars from the Conquista of the New World to the wars of the Counter-Reformation between Protestants and Roman Catholics. The Ministry of the Cross may seem to many people as a paradox. Firstly, due to the fact, that the Cross which was an instrument of torture and death, became a symbol of life. Yet, if we consider that death is a part of the cycle of life then it should not seem paradoxical. Consider the farmer who sacrifices consuming or preserving a seed in order to plant it within his field, in the expectation of seeing a future harvest, thus outweighing this temporary loss. For the Orthodox Christian this signifies the journey of life which has all its difficulties that tests and risks their faith. This journey begins at birth whereby one is born in the image of God, but their objective is to invest their energies into overcoming their weaknesses and transcending their limitations in order to attain (with God’s help) likeness of God. In effect, to become deified or “God-like” beings, united to God just like the angels. 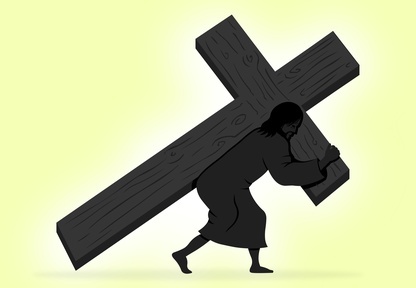 The mystery of the Cross, this symbol of death which bestows life, becomes a prefigurement of our own struggles and the central focus on which our whole lives revolve around, because we carry our own “Cross” daily. This personal Cross is the article of our own affliction, on which our daily cares and worldly sufferings crucify us upon. It is following Christ’s own journey towards His Crucifixion, and yet it is our own personal witness and sacrifice of love, so that with Christ we may also partake within the joy and glory of the Resurrection. To use an everyday analogy, consider how a student attains a tertiary degree so that they may pursue a particular vocation. In that pursuit, the student sacrifices initial employment options that may pay money now, but does not ensure long-term support or employment future. Thus they temporarily forgo the prospect of utilising their full working potential in the present, so that they can devote time to study, research and the execution of their academic tasks. They might work a small casual or part-time job which may not earn them all the money that they require, but is sufficient to ensure their survival in the meantime as they devote themselves to study. Both recreational activities and quality time with family or friends is structured according to the student’s study programme. 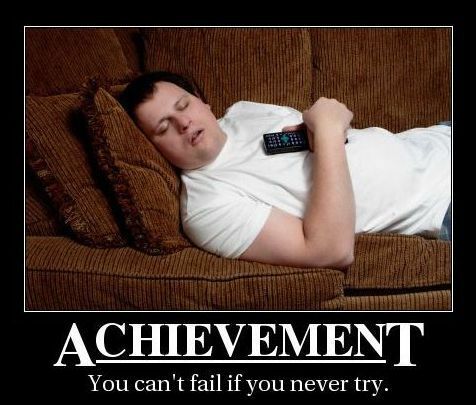 They know fully well, that if too much time or effort, is devoted to work, recreation, family or friends, then the necessary time and energy for study is impinged upon, and could compromise their ultimate goal. These are but a few considerations that a university student must take into account in their effort to attain qualifications that will enable them to pursue a vocation. Business owners in like fashion, must expend time and energy in the overseeing and operation of their business. They must examine inventory, observe sales patterns, train staff, develop processes and so forth, so that they might have a means to sustain their own life and families. In both analogies, and how many more examples we may wish to draw upon, the fundamental lesson is sacrifice, effort and patience. This is what the Mystery of the Cross recognises, in that nothing worthwhile or of value within life is attained without these qualities. Even the way we appear and present ourselves to people, is a conscious and subconscious effort on our part, for time is expended upon shopping for clothes, combing our hair, getting dressed, our manner of speech and walk, or level of hygiene for example. Hence the mysterious reality of the Cross both recognises and reveals to us that we cannot attain our goals or ideals by wishing and dreaming, but must be seized by force like the Sword of the Spirit. Yet an often repeated proverb also teaches us the importance of the tension of struggle and effort in, “That which we gain too easily, we esteem too lightly and even take for granted”. The second point, is that the Cross also marks both the lowest point and the highest point of human history. It is the lowest point since it was God’s creation (humanity), that crucified Christ, while Christ willingly submitted in silence to false accusations, torture and an unjust death as if He were a common criminal. He did not put forward nice sounding arguments or rhetoric to defend the words and actions of His ministry, or of His own person. Instead, in silence and serenity He allowed Himself to be freely subjected to and endure such cruel torments and humiliation out of agapetic love for humankind. Such a powerful example of silent, serene and selfless sacrificial love still resounds loudly through the chronicles of human history. Thus we are also confronted with the irony, that this event marks the highest point in human history because it occurred for the benefit of humanity, since it was the fulfilment of the Law and Prophecies which cited that it was part of God’s plan of salvation, by which humanity will physically be joined to Him. Remember that the Messiah was prophesised to be the messenger of God who was both human and divine, thus bridging the gap between God the Creator and humanity (and all the universe subsequently) which is part of creation, within Himself. In this light we can see that we will suffer the same things He did, but it also means we will be raised to the Heavens as divine-like beings united to God. The third key point is that this feastday not only “re-enacts” the events of Christ’s own journey towards the Cross, or our own journey in life, but “re-lives” that event and reality which took place some 2000 years ago, as a mystery occurring now in our present midst. 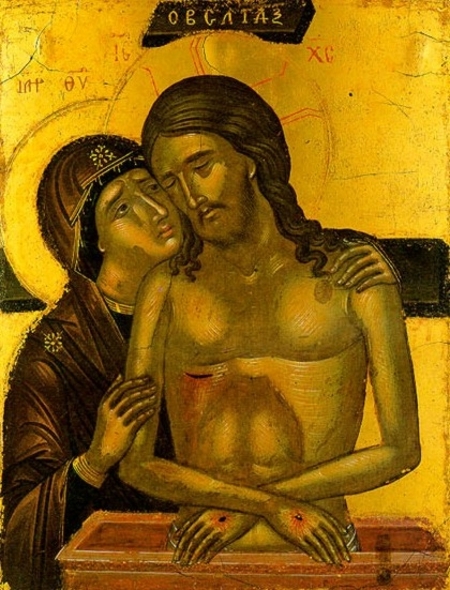 As a consequence the Orthodox Church identifies this feastday as a “penthimos” (sorrowful) feast, and is considered a second “Holy Friday”, and therefore is a day of strict fasting. The first reflection we can draw upon is that the Cross, as viewed by many Church Fathers, is the New Tree of Life as contrasted against the Old Tree of Life that grew in the Garden of Eden. The fruits of the Old Tree brought death upon Adam and Eve, just as God had forewarned them. God’s warning was not a threat as many often misinterpret, but was a statement of fact, because to seek a source of life and knowledge outside of God is futile, and as Adam and Eve (along with humanity) discovered was also fatal. This “distorted” self-will cultivated by a spirit of pride brought the fall-out of death upon all Creation. It is this fall-out which Psalm 50 (51) refers to when it states that, “my mother conceived me in iniquity”, that is, we were conceived into this fallen and imperfect world, not that our mothers were conceiving us in evil. Nevertheless, the Cross became the New Tree of Life, in effect God becoming the fruit of the Tree of Good and Evil, and thus mocking the Devil who had encouraged Adam and Eve to seek the fruits of the Original Tree and estrange them from God. Hence re-establishing God as the source of Life and Truth, and those willing to partake of its fruits must follow the way of Christ by taking up their own cross (Lk. 9:22-26). For the fruits were also Christ’s selfless sacrificial love (agape) that sought to re-establish humanity with the true source of life, which is not an isolationist autonomous self-will, but enjoying the celebration of eternal life with God. Furthermore the Cross highlighted that sacrifice is not something to fear or shy away from, because as it is written, those who do not hate their lives shall lose it (Jn. 12:24-26). That is to say, you need to be ready to make sacrifices and struggle in order to attain your goal, otherwise if you are fearful or seek to avoid those obstacles within life, they will seek you out and destroy you. In effect you must pass through the Cross to see the brightness of the day, just as a grain of wheat dies when it is planted only to sprout forth anew, stronger, invigorated and multiplied. Christ Himself in many instances, just like in Jn. 12:31-32, prophesises His own Crucifixion which He cannot, must not and will not avoid, will also be the means that will bestow life. As how we approach our own crosses, is best illustrated in Christ’s parable of the Sower (Lk. 8:4-15) which speaks about how people respond in different ways to the call of the spiritual life and union with God. Some may receive the call to take up their cross willingly, but when confronted with obstacles give-in, or those who are too distracted by worldly matters ignore the call, and so forth. 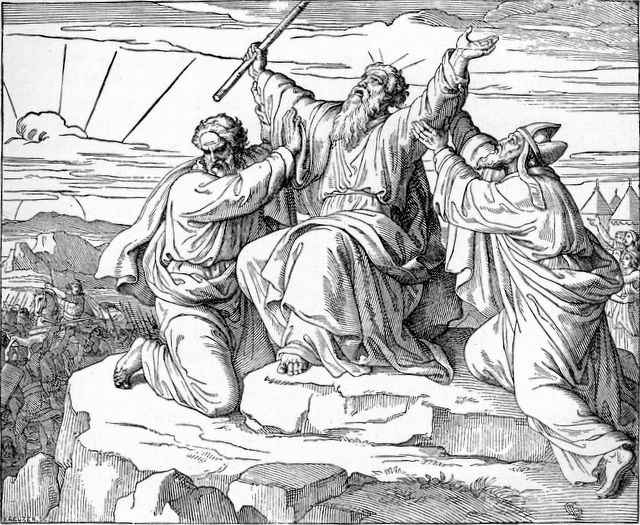 Moses casting his staff into the bitter waters of Marah (Ex. 15:22-25) in order to make the water sweet and drinkable for the Israelites. The staff’s power was a prefigurement and representation of the Transforming power of the Cross, as well as a symbol of the Gentiles being brought forth to faith in God. The Bronze Serpent that Moses makes (Numb. 21:4-9) in order to heal the sicknesses of the Israelites, a reference to the Cross’s power to take away the sting of death, the healing of sin and the bestowal of new life. 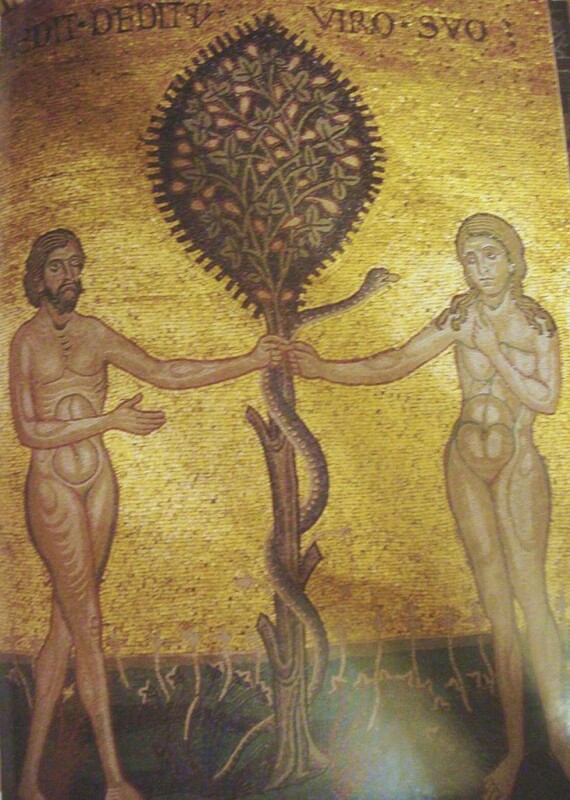 Note the symbol of the serpent here, which represents the Cross, being contrasted with the serpent of Eden (the devil) which had encouraged Adam and Eve to go astray, in effect God is the “Greater Serpent” who swallows up and mocks the “lesser” serpent (the devil) and all his minions. Moses standing upright and holding his arms out-straight thus forming the shape of the Cross on top of the mountain overlooking the Israelites who are battling against Amalek and his tribes who seek to wipe them out (Ex. 17:8-13). Every time Moses was not able to maintain his arms out-straight and upwards the Israelites would be losing the battle, and so there were those who were appointed to assist Moses to maintain this composure till the battle was complete. In brief terms, this is a reference to the struggle of the Cross against our own weaknesses, those who seek to do us ill or the demons which wish to help us fail, only those who persevere with the Cross will succeed. The other point is that to hold one’s arms outwards is also a sign of welcoming and transparency, the fact that you are not curling up to avoid contact or pain, or trying to hide something. Rather that you are open to the world and life, and are willing to embrace both of them head on, knowing fully well and accepting it for what it is. The importance of the Cross is reflected in the liturgical expression of the feastday. At the beginning of Vespers, the cross that a priest or bishop uses to bless a congregation, is taken from the place of its storage and is placed upon a silver tray that has been covered by an “Aer” (liturgical veil), like the ones used to cover the Holy Gospels on the altar, or the Holy Chalice and Patel in which Holy Eucharist is prepared and served from. Decorating the fringes of this veil are fresh flowers and basil, while the cross is placed in its centre. This tray with the veil and cross, is then placed at the Oblation (Prothesis) altar where the Holy Chalice and Patel are stored and used to prepare the Holy Eucharist. A single lit candle is placed before the tray, the tray itself will remain at the Oblation until the point of the Vesper procession. Before exiting the church’s sanctuary, the priest takes the tray with him as part of the procession. Just as the Small and Great Entrances of the Divine Liturgy, the priest exists from the sanctuary’s north door (which has the icon of the Archangel Michael), proceeds around the church holding at chest level (close to the heart) the tray for all to see. He then returns to the sanctuary as he concludes the procession, by coming through the Royal Doors (that is the central doors of the iconostasis) and depositing the tray with the cross upon the Altar. 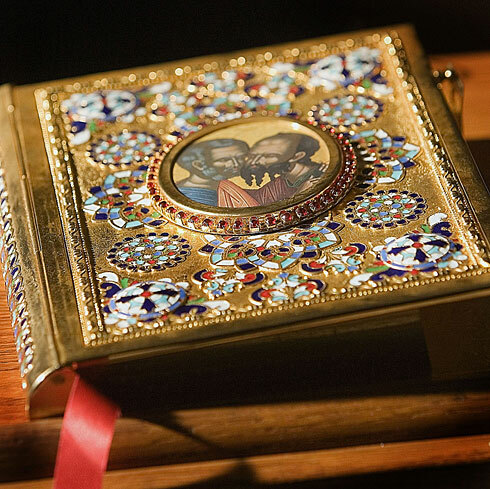 In some liturgical traditions, the tray is placed upon the altar’s Holy Gospels, while in other traditions it is placed alongside the Gospels. The difference probably stems from a point of emphasis, in that by placing the tray with the cross upon the Gospels, is to indicate that the Gospels spoke of the Crucifixion and its centrality (together with the Resurrection) within Christ’s Incarnational ministry. Thus, the thought behind this practice is that the Gospels derive their teaching and existence from the sacrifice of the Cross. 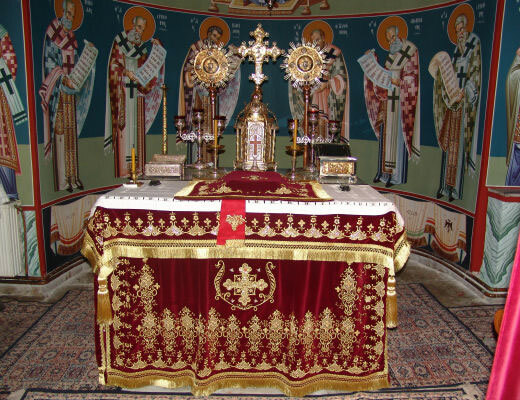 The other practice of placing the tray alongside the Altar’s Holy Gospels, is to express the unity of God’s blessings upon the world through the wisdom of the Word of God (as represented by the Gospels) and the actual, physical expression of that Word in everyday human reality as expressed by the Cross. As for the actual ceremony of the Elevation and Exaltation of the Holy Cross, it takes place towards the conclusion of Matins (Orthros) the following morning. However in practice, particularly in non-Orthodox Christian countries, where the faithful may not be able to reach church until a later point in the festal services, the exaltation ceremony is conducted at the end of the Divine Liturgy. Yet the actual order of the ceremony occurs in Matins, where at the beginning of Matins a wreath is made from basil, seasonal flowers, herbs and possibly rosemary, lavender or bay leaves. The wreath is surmounted upon a base which the priest will carry, and at its centre is a mound in which the Cross will be fixed into. Thus, the priest takes the blessing cross from the tray, which is upon the altar, and fixes it within the centre of the wreath. Then towards the conclusion of Matins after the chanting of the Great Doxology is completed, the Trisaghion hymn is chanted to a drawn-out funeral melody, as the priest exits the altar sanctuary from the north door, holding above his head (or resting upon his head) the wreath that is crowned with the cross and three lit candles. He proceeds around the whole church, proceeding up the north aisle, along the west aisle (that’s at the back of the church near the narthex), and returning via the south aisle towards the solea. At the centre of the solea, before the Royal Doors is a table which the priest circles around 1 or 3 times (depending on local liturgical custom), while being censed. The priest then stops at the west end of the table, that is, he is facing east towards the altar with his back to the people, and raises the wreath and proclaims aloud “Wisdom arise”, which is an invocation to the whole universe (including himself and the congregation) to stand in reverence before the wisdom of God. He then places the wreath upon the table and takes the censer, and censes the wreath from all four sides of the table. Again in some liturgical customs the circling of the table where the priest briefly pauses to cense from the four sides of the table is either 1 or 3. As he does this, the Apolytikion of the feast is chanted three times, and its duration varies according to whether the priest circles and censes the wreath 1 or 3 times. If there is a deacon present, as the priest censes the wreath at the four sides of the table, he recites a series of prayerful petitions from a litany to which the choir and the congregation affirm by chanting “Lord have mercy”, a hundred times. If there is only a priest present, he could choose to recite the litany petitions as he censes or when he stops censing and resumes standing at the table’s west side, facing towards the altar. The priest then removes the cross and cuts off a section of the wreath, and binds the two items together. He then holds the bound cross and wreath sprig with both hands before or above his own forehead. Then the priest slowly bows down reverentially to the ground, where he is almost fully prostrate, with his own head only 1 inch above the ground. He then slowly rises up. As the priest does this, the chanters and the congregation, chant a hundred times “Lord have mercy”, which is divided into 50 times for the priest’s descent to the ground, and 50 times as he arises from the ground. The priest then proceeds to the south side of the table where he faces northwards and repeats the same prostration and rising up to the hundredfold chant of “Lord have mercy”. The liturgical action is repeated again when the priest stands on the table’s eastside facing west directly at the congregation, then again at the table’s north-side facing south, and then the full circle is completed with the final prostration and ascent on the table’s west-side facing east towards the altar. This series of liturgical expressions repeats those same actions which St Macarios of Jerusalem did when he ascended the ambon and raised up the Cross in the four directions of the compass within the service of the exaltation that took place after the discovery of the Cross. In returning to the liturgical actions of the priest, after the fifth and final prostration and ascent, the choir and congregation chant “Glory to the Father, and to the Son and to the Holy Spirit, both now and ever, and onto the ages of ages, Amen.” This is then followed by the Kontakion of the Cross, “O Thou Who wast lifted up willingly on the Cross…” During the singing of the kontakion the cross is again laid on the table, after which the veneration of the cross takes place. “Before Thy cross we fall down in worship, O Master, and Thy holy Resurrection we glorify” is chanted thrice, first by the clergy, then twice by the choir. After each repetition a prostration is made, regardless of what day of the week it may be. Then the choir chants special stichera to the cross, during which, first the clergy, then all the worshipers venerate the cross, making three prostrations before it, as usual; that is, two prostrations before venerating, then one after venerating. 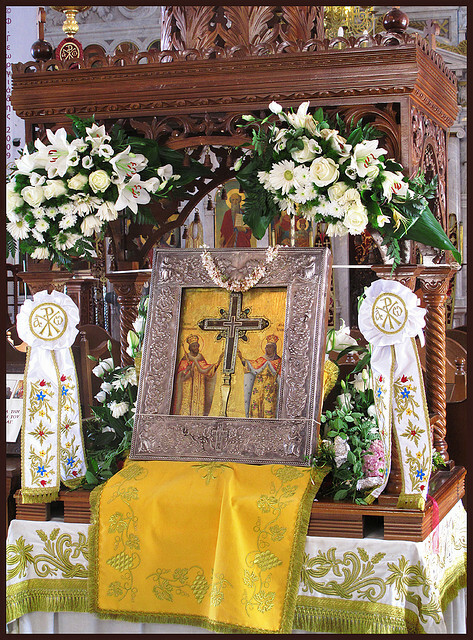 (However in some parishes, instead of the full exaltation rite, where the clergy and laity come and venerate the cross with three prostrations; then the chanting of “Before Thy cross…” occurs immediately after the festal Apolytikion — “Save, O Lord, Thy people” — and the censing. This of course is the usual practice in many parishes within Australia across many Eastern Orthodox Christian jurisdictions). Yet if the full rite of the Exaltation of the Cross has taken place, then after the veneration of the cross, the augmented litany, “Have mercy on us, O God…,” is not pronounced, as is usual at a vigil. Instead the supplicatory litany is immediately said: “Let us complete our morning prayer unto the Lord.” During the bringing out of the cross the ringing of the church’s bells occurs. The chief clergyman, who carries out the cross, regardless of whether he is a priest or a bishop, vests in full vesture before the time for the bringing out of the cross. The cross remains in the center of the temple throughout the afterfeast, and the faithful venerate it whenever they enter or leave the church. Finally, on the leave-taking (apodosis) of the feast, the priest and deacon will cense around the cross, there will be a final veneration of the cross, and then they will solemnly bring the cross back into the sanctuary through the Royal Doors. This same pattern of bringing out the cross, veneration, and returning the cross at the end of the celebration is repeated at a number of the lesser Feasts of the Cross. 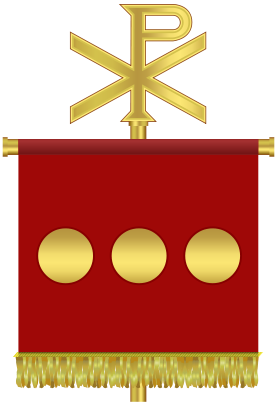 In having explained in brief terms the manner and actions of how the service of the Elevation and Exaltation of the Holy Cross is conducted, we now need to examine and explain the symbolisms of these liturgical expressions to better appreciate all these unique gestures and the items utilised. Firstly the wreath is a symbol of triumph for as we know that in past times that the people who wore wreaths were either people of power like kings or governors, or alternatively were military commanders and generals who had triumphed in war and lauded their conquests, or they were athletes who had won in the sporting events of religious festivals like the Olympics. Therefore the Church is liturgically proclaiming a reality about the Cross of Christ, being that it is the supreme symbol of power and victory on behalf of humanity, and is held high above all other things. It is for this reason that the priest bears the wreath above or upon his head. It is thus indicating that humanity and all of creation, lives under the selfless authority of the Cross and the inheritance of its ministry of agapetic love. Furthermore the bowing of the priest at the four points of the earth indicates that nothing or no one has plunged to the depths that the Cross did in being the instruments of Christ’s torture and His entry into Hades. Yet as we said before it is held above the head of the priest which cites the Mystery of the Cross, in that nothing or no one is higher or reached the heights of the Cross since it is the ladder between Heaven and earth, thus bestowing the eternal life of the Resurrection. Therefore the reality of the Cross envelops all points of the compass because it is there for all to see, and all are called to partake, for the Cross does not acknowledge borders or horizons, nor discriminates between differences in language, culture or race, but embraces all in love. In relation to the use of three candles within the wreath, it shows us that through the Cross we have a direct communion to the Holy Trinity which enlightens all of creation. 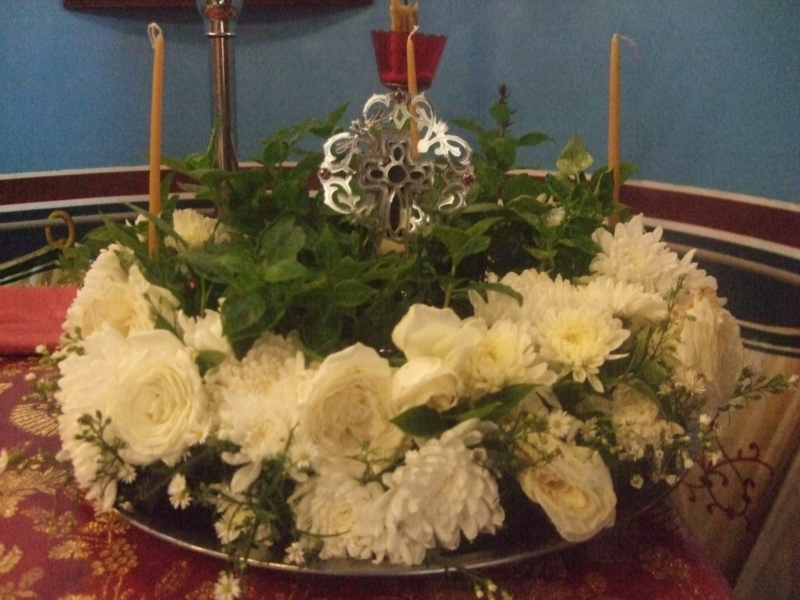 The mound within the wreath on which the Cross and the candles are placed upon, represents both Golgotha and Mt. Sinai (Horeb) whereby God revealed His love, glory and laws before humanity. While the table on which the wreath is placed upon is a symbol of the Church, that is us (congregation and clergy) together with God, the Saints, the Angelic powers and all those who have passed on. With regards to the use of incense, which is part and parcel with most, if not all, Orthodox liturgical services, is an offering of prayer made before God. In a sense this offering is a sort of way of thanksgiving by giving something back to God that shows Him due honour and worship. This is not dissimilar in the way we offer back to God the fruits of our labour (using the material matter that He has provided us) such as bread, wine, oil or the produce of the earth. Our, that is humanity’s, response and offering to God is like that of a little child who offers a present back to their parents who have fed, clothed and sheltered them. Yet even though a little child may not have the abilities of a trade or a craft to produce a gift of “value” or “use”, nor the money to purchase such a gift of “value” or “use”, a loving parent receives such a gift in all joy and appreciation, knowing fully well that the gift is usually “produced” or “acquired” through the resources that they have expended upon their child. Therefore the “value” of a gift is not considered according to its usefulness or meeting a desire or need of the parent, but often means more because of its gesture, intent and sentimental value. It is in this same manner by which we offer incense throughout the service of the Exaltation of the Cross, and for that matter any liturgical service. The use of incense is thus a worshipful acknowledgement of the sacred and the blessings of God upon us, yet it is an offering of prayer and thanksgiving. The symbolism of offering incense adds to this sense because we see the smoke of the incense rise upwards towards the skies which we poetically refer to as “the Heavens” that represent the domains of God and all the Angelic beings. We even chant or read that passage from Psalm 140 (141) which proclaims this very symbolic and liturgical notion: “Let my prayer be set before You as incense, The lifting up of my hands as the evening sacrifice”. Of course when we analyse this imagery and understanding, we see that ultimately, the only thing we truly can offer to God as a gift, is our time. That is, spending quality time with God in prayer and meditation of His infinite mysteries. God may not have need of our words or prayers; but one who comes in all sincerity with a humble and contrite heart, offering their time in worship and prayerful dialogue to God, will as shown by the example of Prophets, Saints and commonfolk, is acknowledged and appreciated by God who bestows further blessings. Such are the results of simple heartfelt liturgical offerings of prayer. The next point of liturgical observation is the fact that the wreath is formed in the shape of a circle, and that the priest goes around the table and wreath at various points of the service in a circular manner. This of course brings our attention to the fact that the outline of a circle does not have a visible beginning or end, nor does it have a visible turning point like other shapes, like for example a square. Naturally this expresses the notion of eternity and embraces all that is within its confines, while all that comes before it are forced to remain upon its edges on an equal footing. 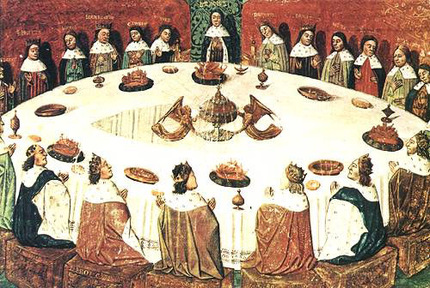 Take for example a rectangular table where we identify that there is a “head” or “point” of the table, whereas at a circular table there is no such thing, because everyone who sits around a circular table, sit equally and open to one another. This is partly why Orthodox churches, as opposed to the earlier Apostolic era basilican style churches, are built with a dome that is able to “embrace” openly and enclose the entire congregation. 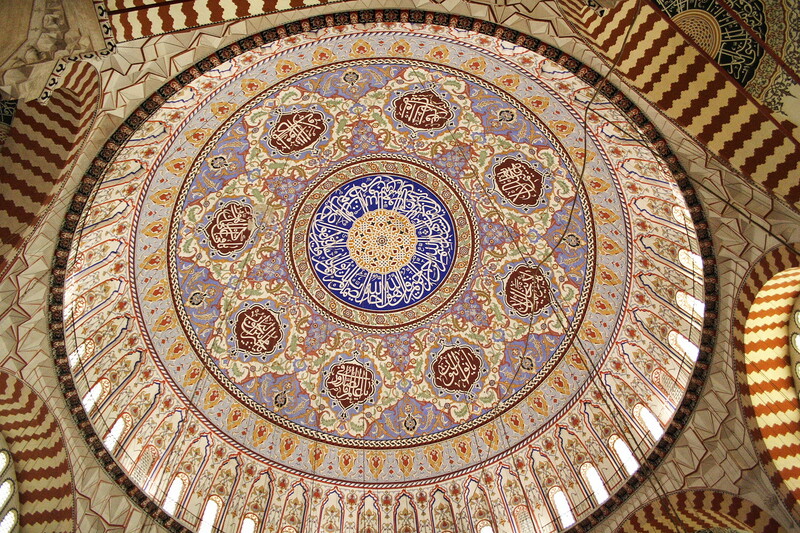 The very notion was adopted within Islamic religious architecture, where Muslim scholars felt this idea of the circle and sacred geometry, best expressed their own religion and its notion of the unity of the brethren (al-ikhawan) within the umma (ecclesia/community) of God. (From an engineering point of view, a circular dome is the most effective way of creating the largest indoor space that can encompass as many people as possible). Of course another example are the traditional folkloric dances of many different nations and cultures which are often formed by people holding hands with each other, thus creating a circular shape where all the dancers can see each other openly and equally. Some may even include “group hugs” or “huddling together” as examples, but whichever imagery one uses they all express an eternal reality of God who neither has a beginning nor an end, and embraces us all on an equal footing. 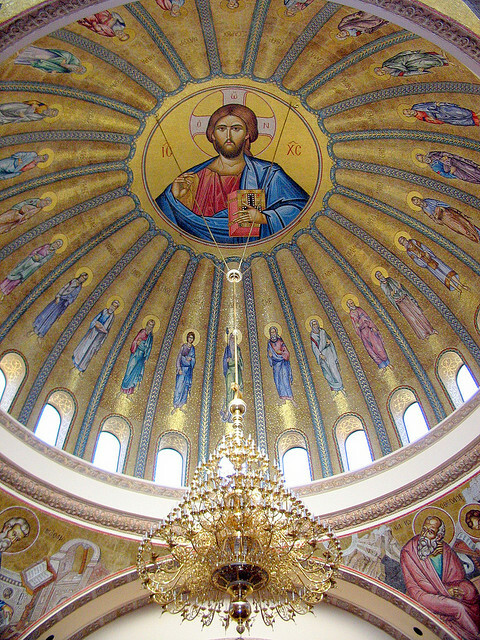 That is one of the reasons why in domed Orthodox churches there is an icon of Christ the Pantocrator (Ruler of the Universe) that crowns the dome’s centre, this icon looks down upon those within the church, and through the dome’s curved shape gives the appearance of Christ “embracing” those present. Yet it also reflects according to what has been revealed, the inner reality of God as Trinity, where the Father, Son and Holy Spirit who eternally embrace one another in an eternal union of agapetic love. Finally, we should make note of the 5 times which the priest descends and ascends during the service of the Exaltation. In simple terms it is for liturgical convenience that the priest completes the circle at the same point of where he begun, thus 5 prostrations and ascents. However the open and closing of this circular action has its own significance in expressing the meaning of a circle. 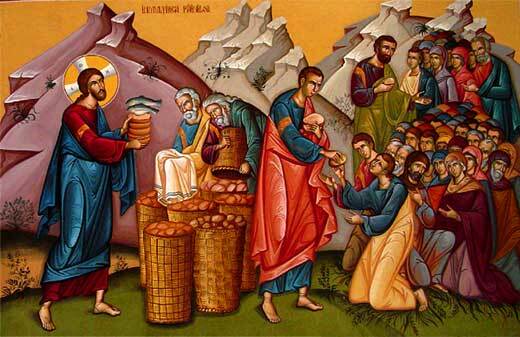 But the number 5, reflects the 5 loaves of bread by which Christ fed the multitudes. With respects to the Exaltation of the Holy Cross, the meaning is simply that it is the ministry and inheritance of the Cross that God has bestowed in order to quench the human soul’s hunger for eternal life. Like those multitudes in the Wilderness who were fed with the 5 loaves, the soul of every person is offered the Cross as the food of immortality. It is noteworthy to point out that the invocation of the Cross by Christians when they do the sign of the Cross, predates this particular feastday, and we have evidence from writers of the Apostolic and Early Christian period making reference to doing the sign of the Cross especially at baptism (cf. The 3rd century works of the priest, Hippolytus’ “On the Apostolic Tradition). 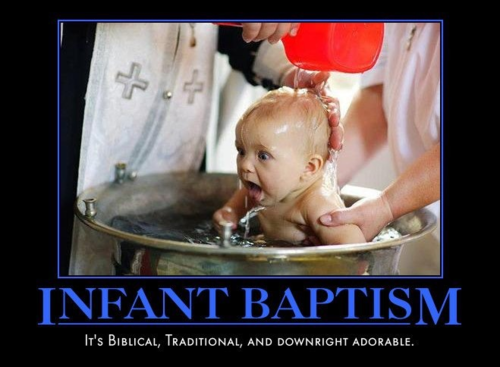 An interesting parallel that has come down to us since that time is the custom with infant baptisms whereby the priest raises the baby making the sign of the Cross before immersing the infant. Another interesting example is drawn from iconography whereby we have martyrs depicted holding small crucifixes as the symbol of their faith and hope in which they show confidence in their own salvation by bearing witness unto death the salvific truth of the Cross. 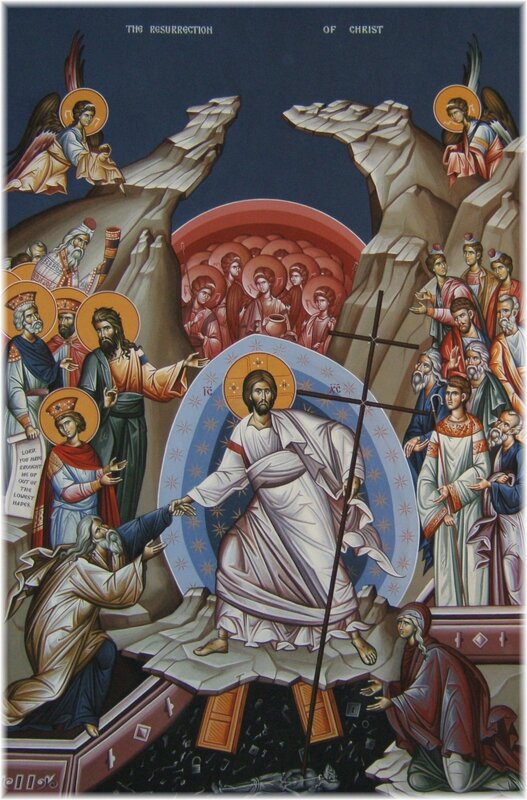 Furthermore if one observes the many examples of the icon of the Resurrection we have Christ crushing under feet the gates of Hades in the shape of a crucifix. While in numerous icons of His baptism in the Jordan, Christ is depicted treading on a crucifix which is crushing the symbol of the devil which is the serpent. Again, the imagery linking the Genesis story of Adam’s failing at the original Tree of Life, being defeated by the Tree of the Crucifix by the New Adam (Christ), who washes away sin with the life-giving waters of His grace and blood. Wheat husks – Symbol of Christ as the bread of life, because wheat was the most basic and affordable food item and thus the staff of life from the poor to the rich. If one looks at the development of the world’s first civilisations, the cultivation of wheat marks the beginning of the first farmers and the construction of settled organised communities and cities. 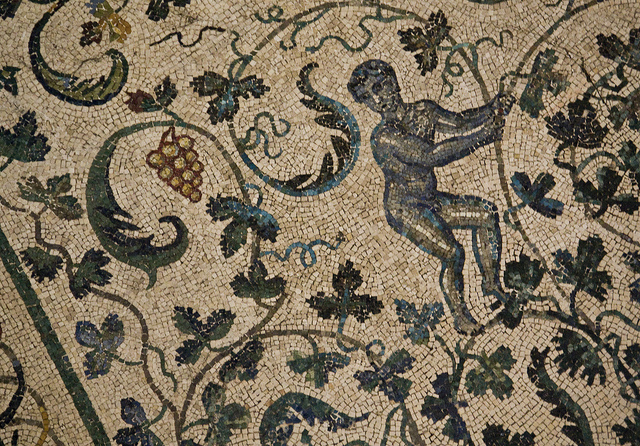 Grapes & Grapevines – Reference to the other key staff of life which was purer than the water that was drunk at the time, wine. A reference to the Eucharistic blood of Christ, but also the tough, long-lived and enduring characteristics of the grapevine identifying Christ and the Christian who “abides in Him” as steadfast, strong and wise. 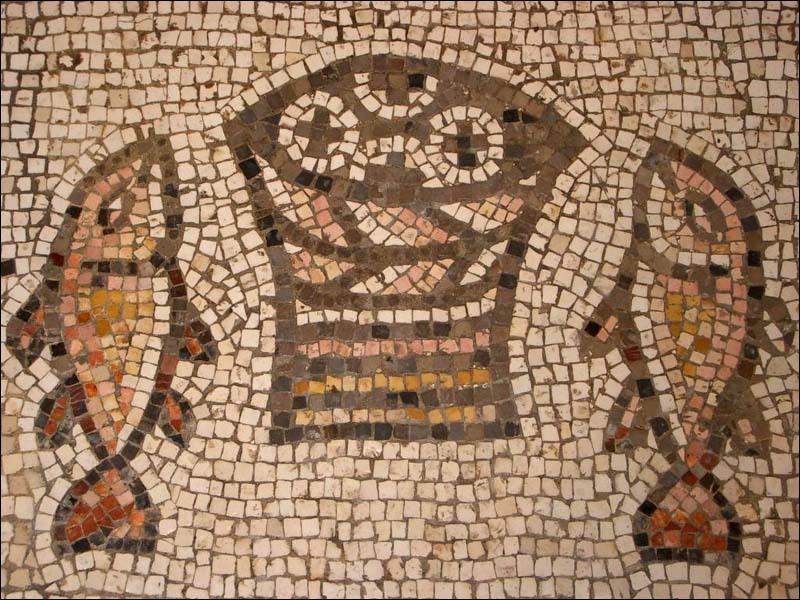 Fish – A very popular image used to represent Christ, since many of the Apostles were fishermen and that Christ had called them fishers of men. Yet it is also because the Greek word for fish, ΙΥΧΘΣ, served as an acronym for the Christian confession of faith in Christ: Jesus (Ιησούς), Christ (Χριστός), God (Θεός), Son (Υιέ), Saviour (Σωτήρ). 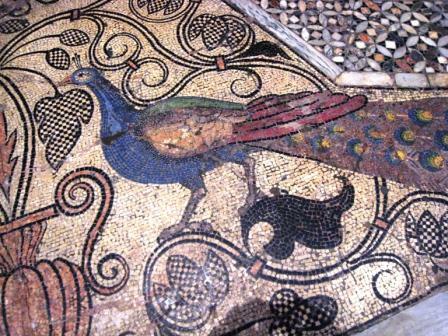 Peacock – The blue colouring of the peacock represented in the ancient world the divine light (as shown in Orthodox icons of the Resurrection) of immortality and eternal life. It was also believed at the time, that the consumption of this bird at great banquets would bestow this eternal life of immortality, while prolong our earthly life. The link with Christ was a Eucharistic reference drawn from St. John’s Gospel, whereby Christ proclaims that whoever partook of His Body (Bread) and Blood (Wine) will dwell in Him and He will dwell in them and have life-everlasting. Font of Water – Water being the source that sustains all earthly life, the link here is clear, Christ as the source and sustainer of life, or as He refers to Himself before the Samaritan woman as the well of living waters. 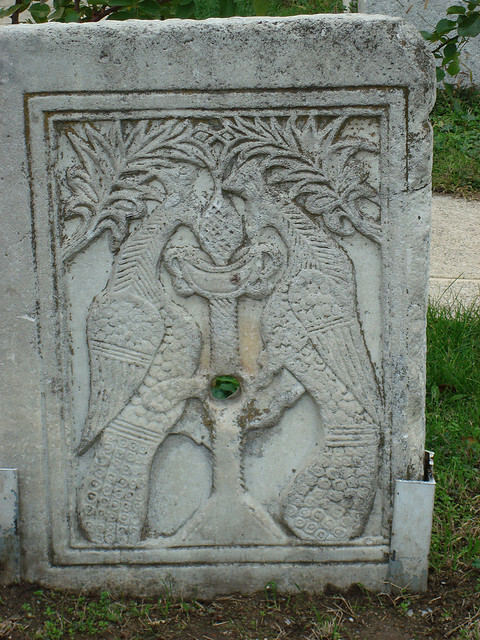 Usually in these depictions there are two peacocks drinking from this fountain, the male bird representing Christ and the female symbolising Mary the Holy Theotokos. Orpheus – A troubled figure within Greco-Roman mythology who is confronted with the testing hardships of this world and falsely persecuted by deities and humanity alike. Orpheus though, had the gift of music which he used to descend into Hades, to retrieve his lost wife Eurydice from amongst the dead and rise again. But the analogy between Christ and Orpheus stops there, but the imagery was used because of the Pagan origins of many of the early Christians who needed an example of what rising from the dead or descent into Hades meant. All these symbols were direct or indirect references to the ministry of the Cross and the Eucharist. 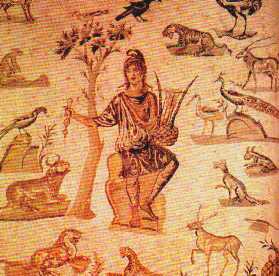 One must remember that the Christians had to blend in within the wider society of pagan culture and had to use the symbols of the day to explain and teach their beliefs. Furthermore with persecutions came raids or surprise inspections of churches which had to be disguised as pagan places of worship, pagan mystery cults or as philosophical brotherhoods. The outright use and depiction of the Cross really takes shape from the time of St. Constantine and onwards, in effect becoming an openly public and acceptable symbol for the first time in history. 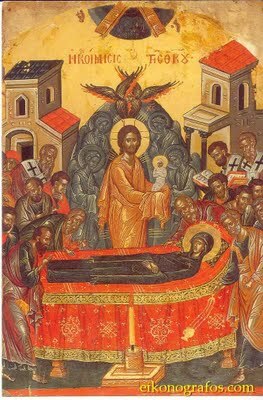 A final but distantly related example is the use of the Cross to structure various iconic depictions of the Theotokos’ Dormition. The Virgin Mary is lying horizontally upon her “death-bed” while Christ stands in the centre holding His mother’s soul in His arms, with the Heavens and angels above Him with the Divine Light shining down upon Him and Mary’s soul. Directly at the parallel end of the bed are usually candles or lanterns which complete the shape of the Cross, alternatively we have the impious thief who seeks to desecrate the Holy Body of Mary by trying to steal her, but is stopped by angels who cut off his hands. In this latter representation the iconographer’s symbolism is demonstrating the power of the Cross by which those faithful can transcend and overcome impious worldly cares which are crushed underfoot by grace and eternal life. This reading tells of the “tree” which made the bitter waters sweet, the symbol of the Tree of the Cross. This passage reminds us that the Lord chastens and corrects those whom He loves and that Divine Wisdom is “a Tree of life to those who lay hold upon her and trust in her, as in the Lord”. Prayer for God’s forgiveness and petitions God’s help to cultivate a contrite and humbled heart which the faithful wishes to offer back to God. In it Christ says that when he is elevated on the Cross he will draw all men to Himself. The core message of this pericope revolves around St Paul’s statement “the message of the cross is foolishness to those who are perishing, but to us who are being saved it is the power of God”. Gospel: John 19:6-11, 13-20, 25-28, 30-35. This long reading is the passion account of Christ’s Crucifixion. By bestowing on them the Invincible trophy, Thy weapon of Peace. The first focuses on the wood of the Cross of Christ which stands in as the New Tree of Life as opposed to the Old Tree of Good and Bad which Adam and Eve consumed from. The New Tree of Life brings redemption for its fruits are the works of Christ’s sacrificial love for humankind and all creation. Of course when one reads the following text it is worth keeping in mind the importance of the discovery of the True Cross in Jerusalem, the building of the “Martyrion” over the site of Golgotha, the construction of the Church of the Resurrection (Anastasis) over Christ’s tomb, and the veneration of the True Cross in Hagia Sophia in Constantinople after its recovery from the Persians. In days of old Moses transformed with wood the bitter wells in the wilderness, prefiguring the bringing of the Gentiles to the true faith through the Cross. – From Canticle Four at Matins. The fourth theme is raised by St John the Evangelist who makes use of the story of Moses and the serpents, using the raising up of the bronze serpent to make the point that Christ raised up on the Cross takes away the sting of death and gives hope of new life (cf. Numbers 21:4-9 and John 3:13-15). This same typology appears in the hymns for this Feast. 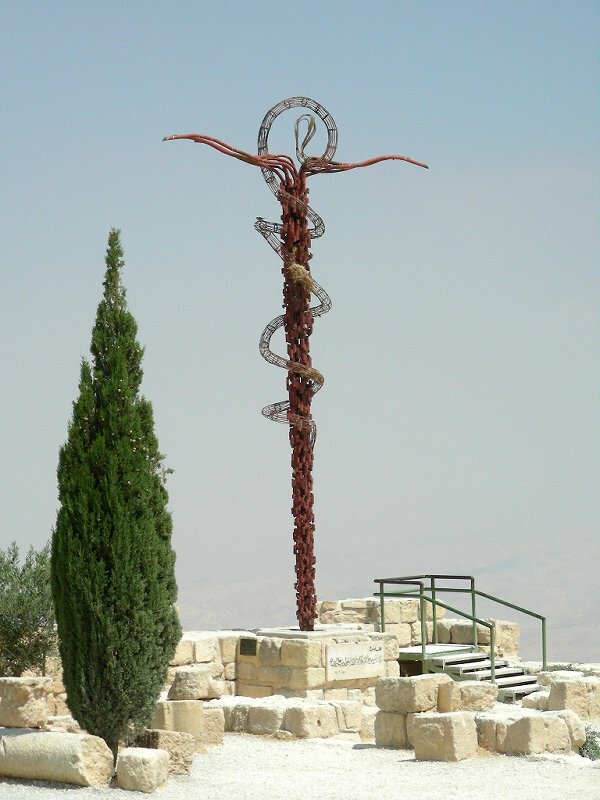 Moses set upon a pole a cure against the deadly and poisonous bite of the serpents: for crosswise upon the wood – as a symbol of the Cross – he placed a serpent that creeps about the earth, and thereby he triumphed over calamity. Therefore let us sing to Christ our God, for He has been glorified. – From Canticle One at Matins. 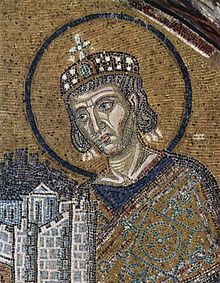 That aside, we should also now give attention to the immense influence that St Constantine the Great had on the development of Church’s presence within the Byzantine state, and his mother St Helen’s influence on the development of pilgrimage sites and relics associated with the origins of Christianity. 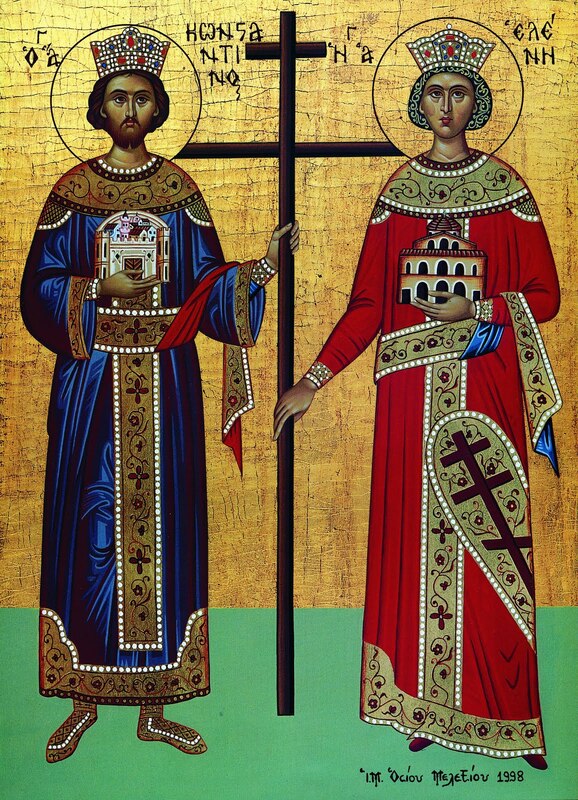 These two founders of the Byzantine theocracy are often represented together in icons and frescoes on either side of the True Cross, and naturally they invariably appear within hymns of this particular feast. Of particular note, St Constantine’s vision of the Cross in the heavens and St Helen’s recovery of the True Cross from the site of Golgotha have left a permanent impression on the Orthodox Christian tradition. The final theme which we should draw attention to is the sense of joy and hope that is conveyed through this celebration of this significance of the Cross of Christ for the life and society of the Christian world. Shining with pure rays, the holy Cross sheds its divine light upon the peoples darkened by the beguilement of error, and it reconciles them to Christ who was crucified upon it, granting peace unto our souls. – Canticle Five at Matins. Lifted up of Thine own will upon the Cross, do Thou bestow Thy mercy upon the new commonwealth that bears Thy Name. 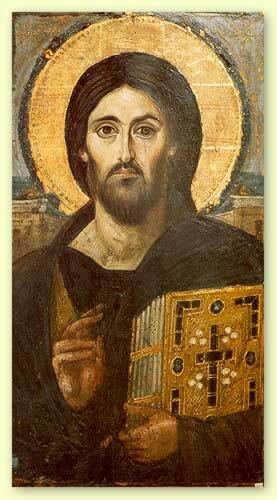 Make the Orthodox peoples glad in Thy strength, giving them victory over their enemies: may Thy Cross assist them in battle, weapon of peace and unconquerable ensign of victory. – Kontakion of the Feast. We should also note that the normal antiphons of the Divine Liturgy are replaced by special verses from the Psalms 22, 74, and 99, which have direct reference to Christ’s crucifixion on the Cross. both now and ever, and unto the ages of ages. Amen. And Thy holy Resurrection we glorify. Before Thy Cross we bow down in worship, O Master, and Thy holy Resurrection we glorify. 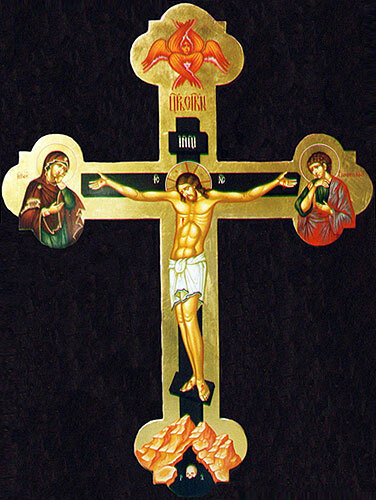 The festal icon of the Exaltation of the Holy Cross is fairly self-explanatory because it presents us with a historical image of the first original service of the Holy Cross’ elevation and exaltation upon its discovery in Jerusalem. The central focus of the icon is of course the Holy Cross being raised by St Macarios who is vested in his episcopal raiment, as can be seen by his omophorion and chasuble with the multiple crucifixes. With devotion and a serene face St Macarios looks up at the Cross which he holds in his hands, but in doing this he is also looking towards the Heavens. The iconographic depiction itself, indicate his silent prayerful supplication before God, while Jerusalem’s multitudes surround him and looking up towards his hands and the Holy Cross which they embrace. St Macarios is raised high with the Cross by standing on the wooden ambon that had been made for the specific occasion. All around the ambon are young men who are dressed in diaconal vestments holding candles and incense, while offering their available hands in prayerful petition in the direction of the Cross and their spiritual father, the revered St Macarios. The placing of St Helen and her retinue within the festal icon varies from one iconographic version to another, but the usual convention is to locate her in the bottom left hand corner of the icon, surrounded by her female attendants who wear veils. 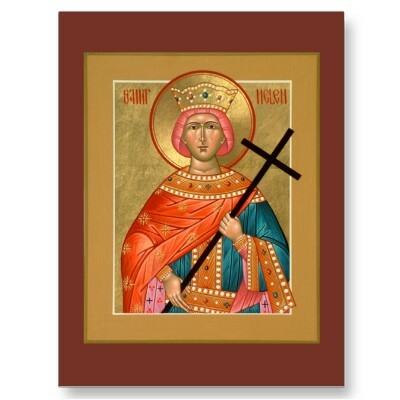 St Helen stands out because she tends to wear bright colours, usually crimson, that is decorated by rich brocade embroidery, she is the only female figure not wearing a veil, but is crowned by an imperial diadem. She too, raises her hands in prayer and looks upwards at the Cross. The placing of St Helen on the left is significant, because it is the icon’s right hand side, but to the viewer who faces the icon it is the left side of the icon, and the left side in iconography is the place of honour. The multitudes of Jerusalem surround the deacons and St Helen’s retinue. However in some icons, St Macarios is often, also shown walking towards the ambon behind the deacons. In some case he merely has his hands outstretched in prayer, while in others he is carrying the Cross towards the ambon. This point indicates two things, the first is movement of persons within the icon such as Macarios processing towards his holy task of elevating the Cross. The second point is to illustrate something of his humble character because he stands behind the deacons, but the iconographer honours his humility by placing him on the side of the icon that the viewer distinguishes as the right side. In some icons he is accompanied by St Helen and her retinue as they process towards the ambon and the service that is to take place there. 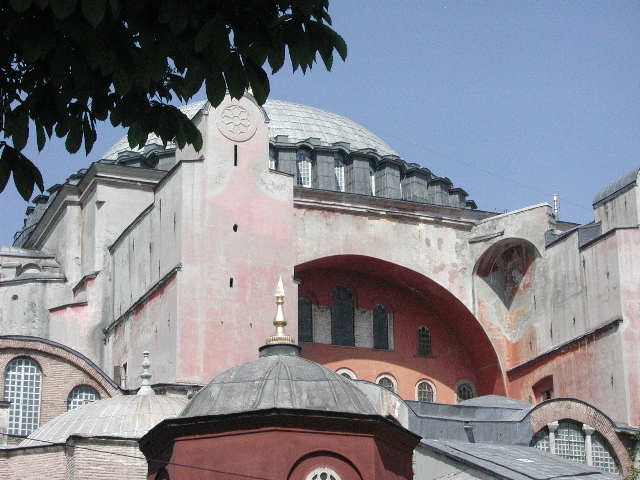 The building structures in the icon’s background usually depict the Church of the Resurrection compound, which is usually marked by a canopy or a dome. In some icons the iconographer includes an image of the later structure of the Church of the Crucifixion and Tomb, while in others the Church of the Resurrection is placed to one side and a collection of buildings on the opposite side to indicate Jerusalem. The Armenian Apostolic Church observes a five-day fast, called the Fast of the Holy Cross from September 10 through September 14, in preparation for the Feast of the Holy Church in view of the Holy Cross, which they celebrate on September 15. September 16 is observed as the Feast of the Exaltation of the Holy Cross (Khachverats in Armenian), a feast which continues for several days thereafter. It is counted as one of the five major feasts of the Armenian Church, and the most important of the four feasts of the Holy Cross. According to Armenian tradition, the first one to “exalt” the Cross was the Apostle James of Jerusalem, the Brother of the Lord. 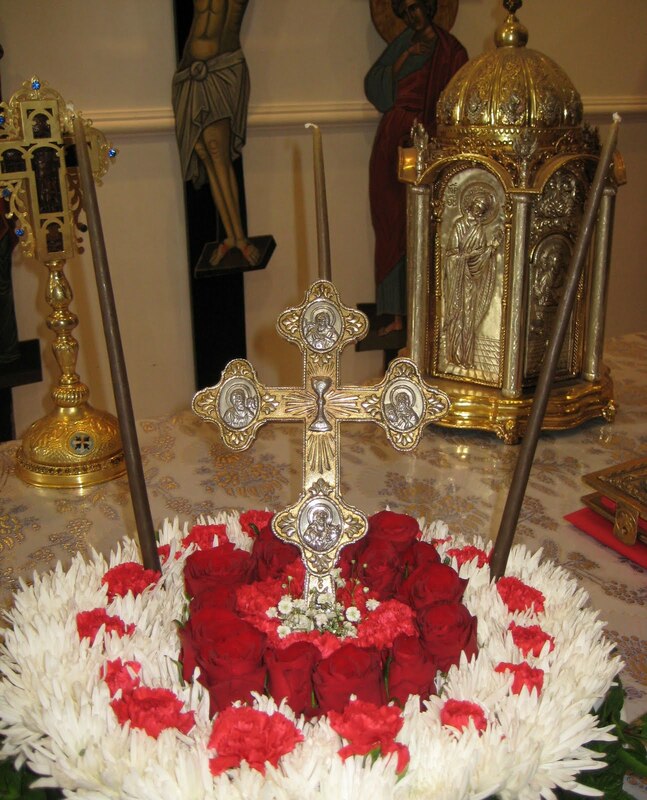 On the Sunday nearest September 14, the liturgy is marked with an antasdan service (blessing of the fields) during which the processional cross is adorned with basil (a symbol of royalty) and the four corners of the church are blessed as a sign of the sanctification of the world. 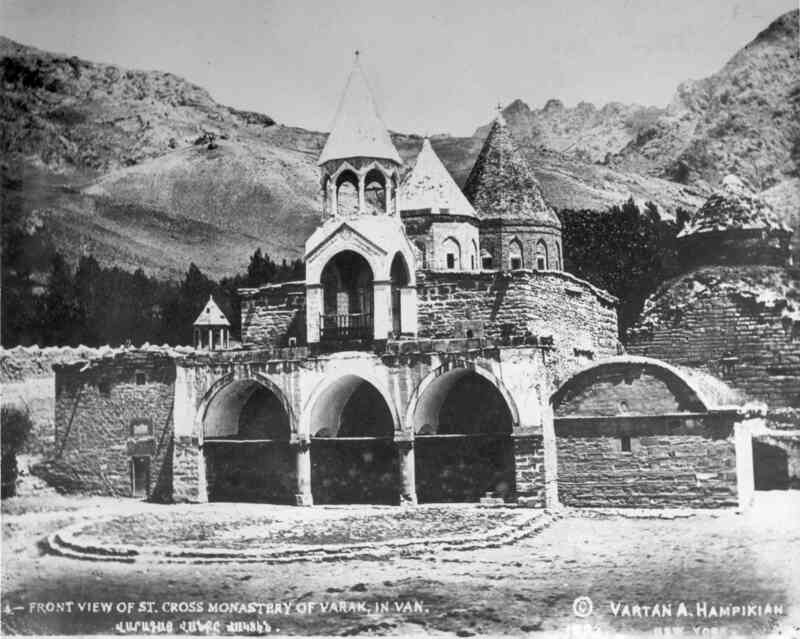 On the Sunday nearest September 28 (always two weeks after the Exaltation) the Armenian Church celebrates the Feast of the Holy Cross of Varak (Varaka Khach) commemorating the third century placement of an authentic relic of the Cross on Armenian soil at Varagavank. This is a Cross feast unique to the Armenian Church. On the Sunday closest to October 26, the Armenian Church celebrates the Discovery of the Holy Cross (Kyood Khach), commemorating the finding of the True Cross by Saint Helena (ca. 327 AD). 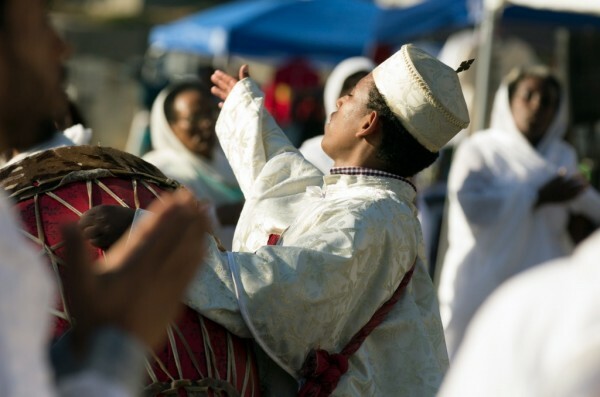 In the Ethiopian Orthodox Church, this feast is called Mesqel and commemorates the finding of the true cross on Meskerem 17 of the Ethiopian Calendar corresponding to September 27 in the Julian Calendar (or, in leap years, one day later). Within the Ethiopian liturgical cycle it commands great importance after Pascha (Easter) and the Nativity (Christmas). 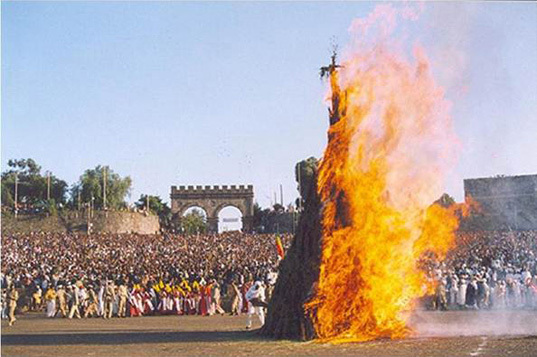 The eve of this day is popularly called “Demera” in Amharic – meaning Bonfire. This is because the faithful all over Ethiopia and Eritrea light bonfires in parish courtyards and village squares to commemorate St Helen’s bonfire that revealed the Holy Cross, and signalled to her son Constantine in Constantinople the success of her mission. The faithful cast daisies into the bonfires to symbolise the incense that descended upon the location of the Cross. The most well-known bonfire on this feast is lit with great ceremony and fanfare by the Patriarch of the Ethiopian Orthodox Church in Maskal Square, Addis Ababa’s greatest open arena. Thousands attend the colourful and vibrant ceremony of religious chanting around the bonfire in Maskal Square, which owes its name to the ceremony, “maskal” meaning in Ge’ez “cross”. 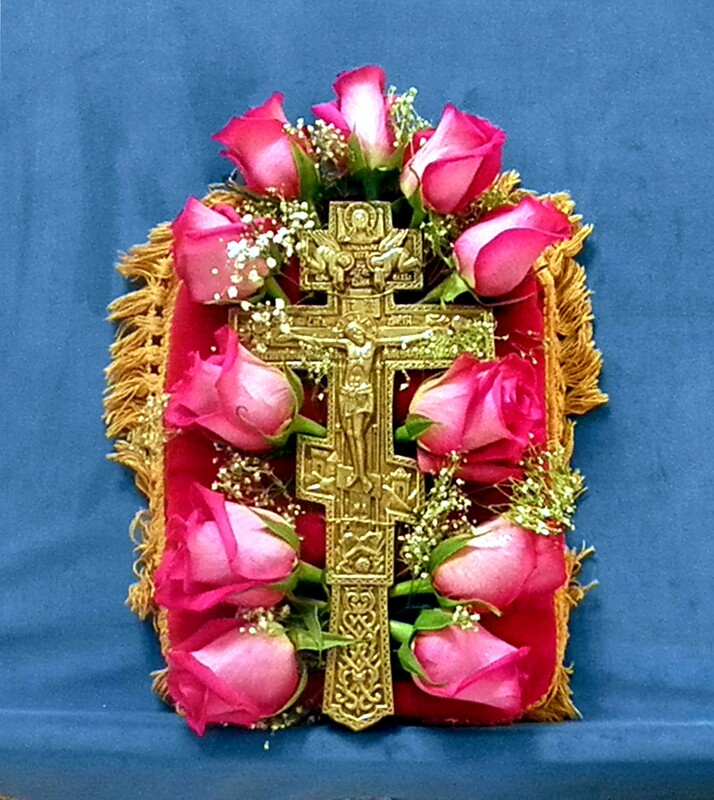 In the Malankara Syrian Orthodox Church a special offering called panchasarayumanda is made on this day, in particular at the Akaparambu Mor Sabor-Mor Aphroth Church in the Ernakulam District, Kerala (Southern India). 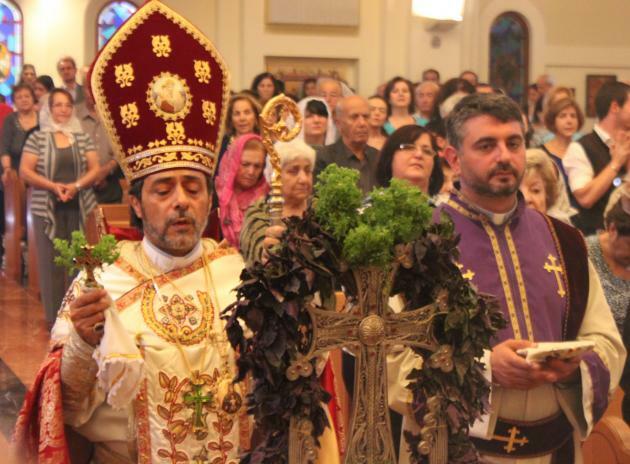 The Assyrian Church of the East celebrates the finding of the Cross on September 13, and considers it to be a major feast. The Assyrian Church considers the Sign of the Cross to be a seventh sacrament, by which all of the other sacraments are sealed and perfected (it takes the place of marriage, which they do not name in their traditional list of sacraments). 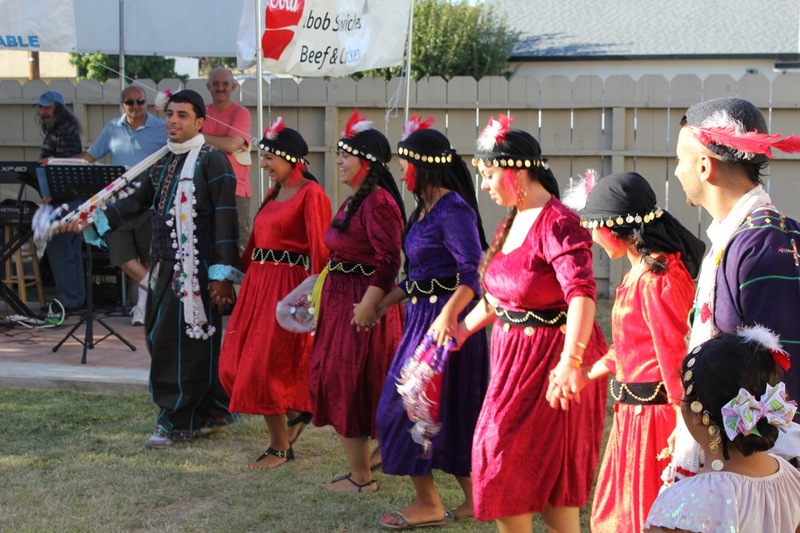 Saranaya (Assyrian) hold a shara every year in cities like Chicago, Illinois, and Modesto, California, and other parts of the world. The shara in Modesto is held every Sunday prior to September 13 at East La Loma Park, where they sacrifice lambs in remembrance of the Feast of the Cross. People gather and feast and sing and dance to celebrate a happy day. In Roman Catholic liturgical observance, red vestments are worn at church services conducted on this day, and if the day falls on a Sunday, its Mass is used instead of that for the occurring Sunday in Ordinary Time, what some would call a Sunday after Pentecost. The lectionary of the Church of England (and other Anglican churches) also stipulates red as the liturgical colour for ‘Holy Cross Day’. Until 1969, the Wednesday, Friday, and Saturday of the calendar week after the one in which 14 September falls were designated as one of each year’s four sets of Ember days by the Church in the West. Organization of these celebrations is now left to the decision of episcopal conferences in view of local conditions and customs. September 14 is the titular feast of the Congregation of Holy Cross and the Episcopal Church’s Order of the Holy Cross. The town of Maa’loula perched up in the mountains north of Damascus, where the western dialect of Aramaic, which was spoken by the ancient Galileans of Christ’s time, is preserved. This particular town, inhabited predominately by Greek Orthodox and Greek Catholics (Melkites), with some Maronite Christians and Muslims, played a unique role within the events of the finding of the Holy Cross, in that it was on the town’s own mountain top that served as one of the numerous summits on which bonfires were lit to relay the good news from Jerusalem to Emperor Constantine in Constantinople. In time it also served as a major stopping point for pilgrims coming overland from Europe and the Caucasus who were travelling towards Jerusalem, and it was the custom of those pilgrims to stop and pray in Maa’loula’s Sacred Garden of Repentance. Yet unlike many other areas of the Christian world, the feast of the Elevation of the Holy Cross was not only a solemn feast, but was also a feast of immense joyous celebration that drew pilgrims to remain in Maa’loula to take part and to visit the monastery of St Thecla (24 September). The week-long celebrations in actual fact were concluded upon the feastday of St Thecla whose monastery is built into the same cliff-face which God opened for her to enter into, in order to escape those harassing her. Many church services were conducted during this week of religious importance, while after the liturgical services, in the church courtyards, dancing, storytelling and the chanting of lyrical poetry was accompanied by improvised proclamations of people welcoming one another. The men of the town would go around the streets and squares chanting slogans and poems to the accompaniment of drums and ouds, carrying bottles of arak and bouquets of basil, visiting every church and house in the town’s environs and welcoming every person and clergymen with affectionate expressions of brotherly love and extending the hospitality of a drink of the arak that they carried. Bonfires would be lit up in every street and square to light the night sky, while in remembrance of the great bonfire that was lit upon Mount Maa’loula, a great fire would be lit in the same place and the chards and pieces of flaming wood were cast down upon the town. The dancing and singing continued day and night. People would gather at common tables within homes, balconies or on the streets where the chanting of lyrical poems and stories would continue to be told, or extol the virtues of the various invited guests who partook in the common shared meal. In amongst this, God was not forgotten, for many verbal recitations and thanksgivings were dedicated and offered to God’s magnanimous mercy and His innumerable blessings. And so stories of Saints and the Scriptures were recalled to memory. Thankfully many of these centuries old traditions are still preserved and perpetuated today during the celebrations that encompass the feast of the Elevation of the Holy Cross. Yet the feast and the celebrations that encompass it, have taken on a greater meaning to the townsfolk of Maa’loula, who due to economic necessity have been forced to migrate to cities and to other lands as far afield as America or Australia, the festal celebrations afford the opportunity to reunite with one another when they return to partake within the festivities. The groups of men who go around the town’s street now issue additional expressions of welcome for peoples’ homecoming and return to their place of birth, and the emotion and joy felt by all cannot be contained, for the day of the Cross is a day of reunion. Dedicated to His Beatitude, Patriarch Theophilos of Jerusalem and the Brotherhood of the Holy Sepulchre who are the defenders and custodians of the Holy Sites of Christianity, preserving the common heritage of all Christians for future generations. –V. M.
 From the Orthodox perspective we would add, that this effort is done in conjunction with God and His helping grace. In its most strict and austere form, in imitation of Holy Friday, the rule of fasting is that no food is consumed at all for the duration of the whole day and night. Not even water is consumed, but a small glass of vinegar is drunk instead. However the Church practice for many centuries and in many places set forth the rule of one meal to be consumed on fasting days and no more than that. That one meal was consumed after 3pm in remembrance and honour of Christ’s sacrifice for humanity. The excesses, or more precisely the abuses to which many interpreters of the Mosaic Law twisted and contorted the Law for matters that did not pertain to it or nullified its actual inherent meaning for expedience, self-interest or for a personal theological position/belief they adhered to. Both are commemorated on the 21st May. St Jerome also cited that at Bethlehem at the site of the Nativity, the Pagans had established a sacred olive grove, a temple and statues dedicated to Tammuz (Adonis). St Macarios, Bishop of Jerusalem (died ca. 331-335AD) was a strong defender of Orthodoxy against Arianism, and was present at the 1st Ecumenical Council, where he took a prominent role in drafting the Creed. 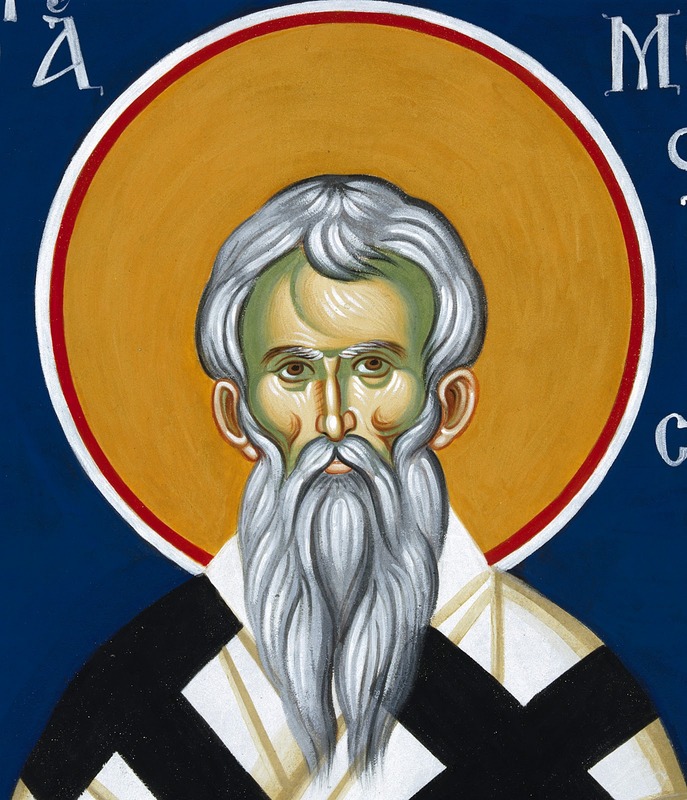 St Athanasius the Great described him as exhibiting “the honest and simple style of apostolic men”. Or as some Westerners often refer to it, as the Greek Church. This is because to the Arabs they were the same race with the same culture and appearance, or as the Italians often say according to their colloquial expression, “Una razza, una faccia”. Ayat in context of the Quran means “verse”, but in its original meaning, it actually means “truth” or “proof”. The assertion being that the verses of the Quran are “proofs” and “truths” that are divinely revealed. 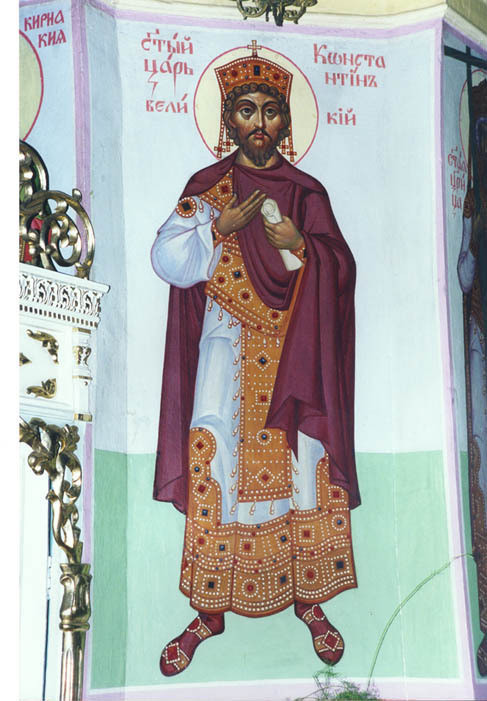 Saint Zacharias, who served as Patriarch of Jerusalem from 609-632AD, and is commemorated by the Holy Eastern Orthodox Church on the 21st of February. This same service would take place in Constantinople on the actual feastday of the Elevation of the Holy Cross in 633AD. If one was not a Jew or Christian, they were offered the option of conversion to Islam or death, since they were not eligible for the status of the Jizyah tax, but subject to the sword, as epitomised by the famous Quranic “verse of the sword”. Of course the question, as we will see later, revolves around the quality and competency of knowledge of Greek by Egyptian hierarchs. Nestorianism, the teaching of Patriarch Nestorios of Constantinople (428-431AD) and his followers, who drew a sharp distinction between the two natures of Christ, thus recognising two distinct persons in Him, the human and the divine. Therefore they argued, Mary should be called “Christotokos”, the Mother of Christ (the man), and not “Theotokos”, the Mother of Christ (the God). The Third Ecumenical Council at Ephesos (431AD) proclaimed One Christ, Son of God and Lord, being perfect God and perfect man, with two natures, the divine and human, “without distinction and without separation”. The word physis (Φύσις) is a derivative of the verb Φύω which means “to grow” amongst many other meanings. Within Eastern Orthodox theological and hymnographical terminology, there is one example still in use today of how the word “physis” does not necessarily specifically mean “nature”, but can also mean “being”, “identity” or “personhood/hypostasis”, and that is the 9th Ode Eirmos of the Akathist Hymn Canon, where it speaks of the “Noetic/Celestial beings celebrating” (Νοών φύσις). We must remember that the Emperor Heraclius was a thorough pragmatist, who recognised that the issues amongst the empire’s citizenry over their Christian Faith was not one that the Barbarian invaders cared about, nor made a distinction between people when they attacked, because they killed all in their path. Thus the Barbarian invaders focused on conquest, settlement, plunder and so forth, such divisions were beneficial for their cause and detrimental to the empire’s cause. It is a point that many modern day historians like to gloss over and try to assert that Moorish Spain was a paradigm of peace, tolerance and coexistence, and to try and justify this point they then compare it to feudal barbarian Western Europe, and its problematic socio-political and economic issues. Yet as one observer cited, Western Europe was coming out of its dark ages, and the people were ignorant of their Christian faith and did many things contrary to it, often with the blessing of Rome. The Arabs and Moors on the other hand who may have appeared to be tolerant in comparison, were nonetheless abiding by their own policy of discrimination which unlike their Western European Christian counterparts, had a theological foundation in Islam. Thus the Western Europeans were merely hypocrites, while the Arab-Moors of Spain and Portugal were merely putting into practice what their religion preached about the eternal war against or subjugation of the unbeliever. Muslim polemicists and apologists often use the example of Spain and Portugal to justify their claims of being tolerant, but to which the narratives of their own chroniclers, and that of the subjugated people, prove otherwise. Either way, it was not their country, and they tried to force their ways upon its peoples, and took whatever they wanted, including the annual levies of “virginal women” to serve as whores to the Muslim soldiers of the Granada Caliphate. Much more could be said but one should not take my word for it, but research for themselves these truths that contradict the supposed image of peace and tolerance of Islamic Iberia. This was the successor to the effective campaign of ecclesial disengagement from the clutches of political authorities in Western Europe, and bringing all diocesan jurisdictions under the authority of the Roman episcopacy. This process of Rome becoming a “para-diocesan” authority exercising political power as well, was the result of the 10th-11th century Western Church reformers coming from the independent monasteries of Cluny and others like it. This reform movement has often been called the effort towards “Libertas Ecclesiae” but had the effect of creating the “Roman Super Church”. As we have pointed out in other articles, agapetic love is a love which always gives of itself freely without expecting anything in return, that always shows due concern for the other and provides for the other’s concerns and needs. It is not forceful, nor demanding, but overcomes all obstacles with patience and forbearance, even if it suffers initially and endures cold-heartedness, evil, indifference, pain and so forth. It is a love which merely carries on quietly and unassumingly. Our references to the Psalms is in accordance to the Orthodox Christian practice by drawing upon the Septuagint Old Testament version. Thus all non-Septuagint references are put in brackets. Now, it should be noted that in some cases, as witnessed by the author, that there are a variety of liturgical customs and expressions, but we cite those practices which are widespread and commonly used amongst Eastern Orthodox Christian clergy, particularly those who follow the “typikon” (order) of the Great Church of Constantinople. That is the worship and ceremonial rites. It is this area of a church’s sanctuary where the Holy Gifts that we know as “Communion” or “Eucharist” are prepared by the priest. And it is here where the items used for preparation or serving of the Holy Gifts are kept under coverings of multiple liturgical veils. An alternate name for Oblation or Prothesis is Offertory Altar, but the terms Oblation or Prothesis are the proper terms. In any case, the offertory wine, holy water, a “longchi” (a sort of knife shaped like a spear and used for cutting and incising liturgical bread -proshoro), the chalice and the patel are kept at the Oblation. To understand the layout of a traditional Orthodox Christian church, one must remember that the church must always be built facing directly eastwards. The exception to the rule are churches dedicated to “Holy Wisdom” whose altar sanctuary must face in the direction of Jerusalem. The iconostasis is the wall that partitions and distinguishes the altar sanctuary from the rest of the church building structure. Its form could either be a waist high partition with some icons placed upon it or a full-sized wall with icons that hang upon it or are fixed to it. Because of the use of icons upon such structures it has thus earned the title “iconostasis”. The iconostasis of course represents the Holy of Holies and symbolises the presence of God within our midst, it is thus used as a means to convey the distinction of God from all of Creation since He can be seen and experienced by humanity, but not in His entirety, and cannot be known or seen in His entirety, hence we are confronted by the infinite mystery of God. 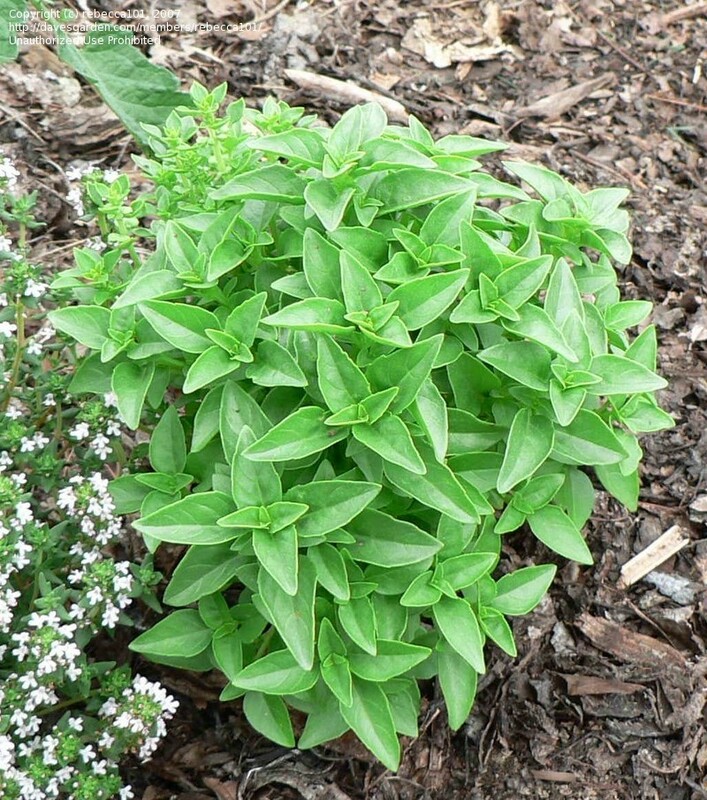 The preference of herbs used tend to be mint, marjoram, sage or wild oregano. “Holy God, Holy Almighty, Holy Immortal, have mercy upon us”. Solea refers to both the platform and steps before the Royal Doors entrance of the Iconostasis, but it also refers to the general area that extends from the iconostasis up to the low fence-screen that separates this front part of the church nave from the rest of the church where the congregation stand or sit. The faithful do not stand in this area because those liturgical services which take place outside the sanctuary, occur in this cordoned off area of the church. In the context of this article, we use the term solea to refer to this area of the church nave and not specifically to the platform and steps before the Royal Doors. This table is not an analogion or altar as some erroneously believe, but it is used for memorial, wedding and baptism services. The idea that we wish to highlight is that in Orthodox Christian theology is that God created the universe out of nothing. This is as opposed to humanity which applies that same God-given talent of creativity to transforming existing matter. The point is that God created out of nothing, while humanity creates from existing matter, but in doing this we bring glory to God for we imitate God’s creative power, but at our own level, provided it is not for evil designs and purposes and thus contrary to God’s agapetic love. There are various Christian mystics who bring to our attention this image of the circular nature of folkloric dances as representing the eternal “panegyric” (celebration and banquet) of Heaven. The word panegyric reveals the eternality of God and His eternal embracing of humanity, by the fact that the word consists of “pan” (all/complete/total/everything) and “gyros” (round/circular/rotate/to go round). The 3 best examples that come to mind is A.) Baptisms, where the sponsor and the baptised go around the baptismal font as the priest censes them; B.) Weddings, where the bride and groom take their first steps as a wedded couple in the circular procession known as the “dance of Isaiah” around the table at the solea; C.) Ordinations, where the one being ordained is led around the Holy Altar 3 times to the “dance of Isaiah”. Psalm 51 in Western Bibles. Aramaic name, it means – “Gates to Paradise/Heaven”.